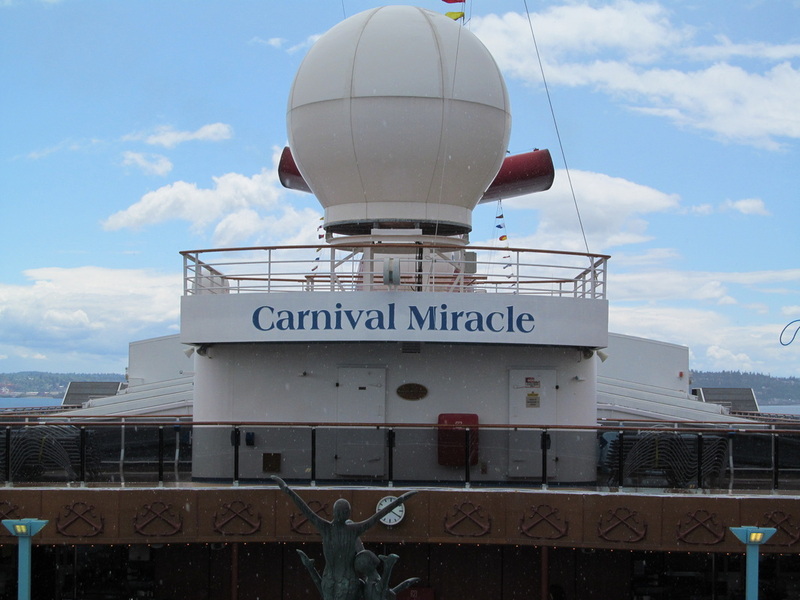 Keep in mind that the tour does not include all places and decks on the Carnival Miracle. 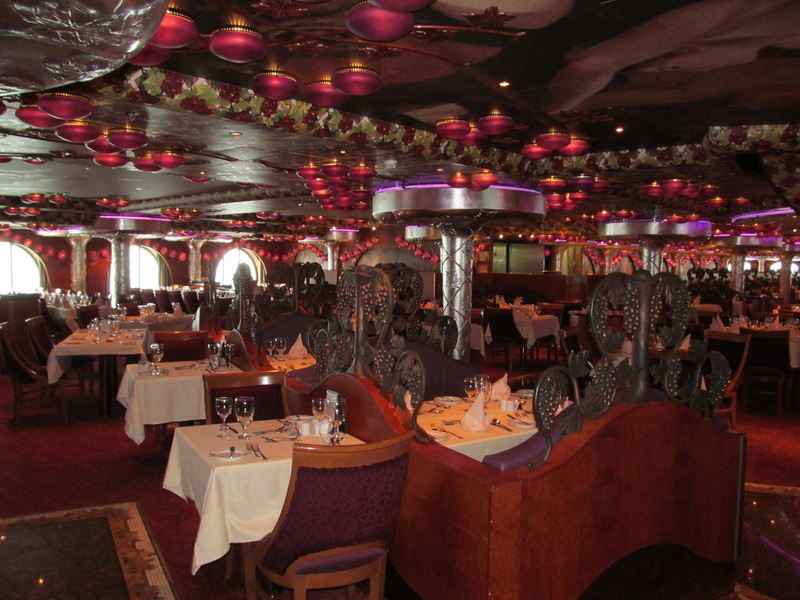 The décor or appearance of the ship may change over time. 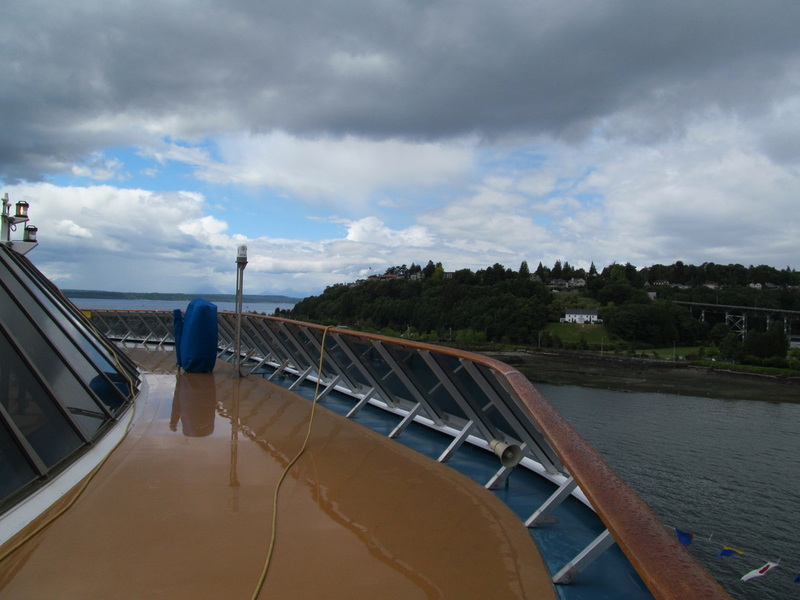 My goal is to make this photo tour useful. 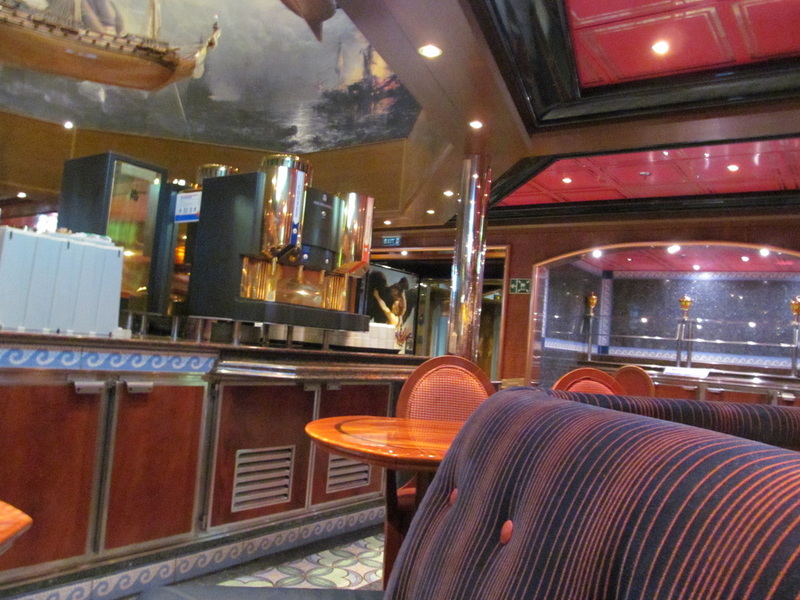 If something has changed or I have made a mistake please let me know. 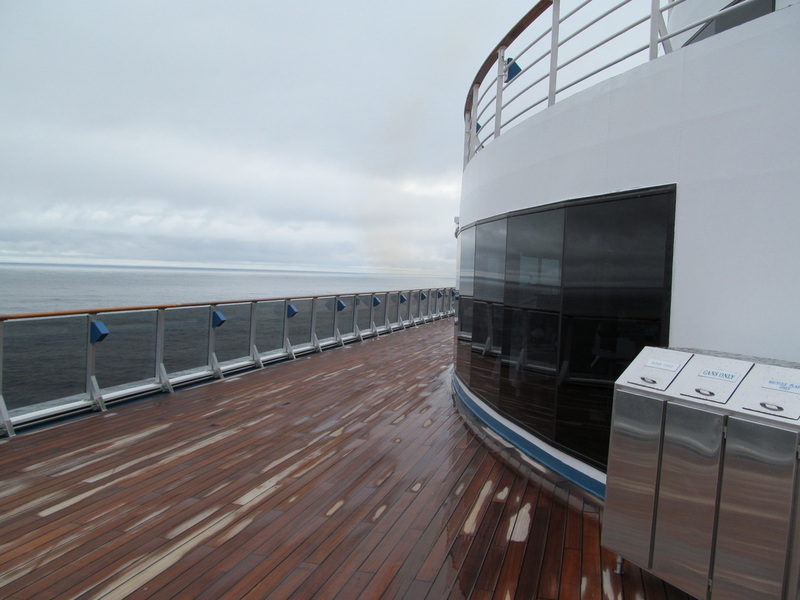 The Riviera Deck (1) is the first passenger deck and is directly below the Promenade Deck (2). 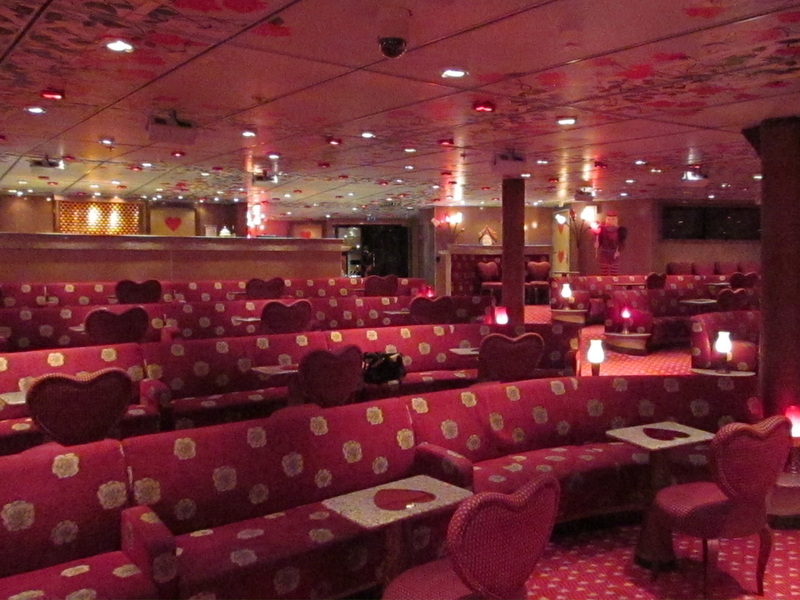 The Riviera Deck primarily contains staterooms, but there are two major public areas on the Riviera Deck - Mad Hatter's Ball and Dr. Frankenstein's Lab Dance Club. 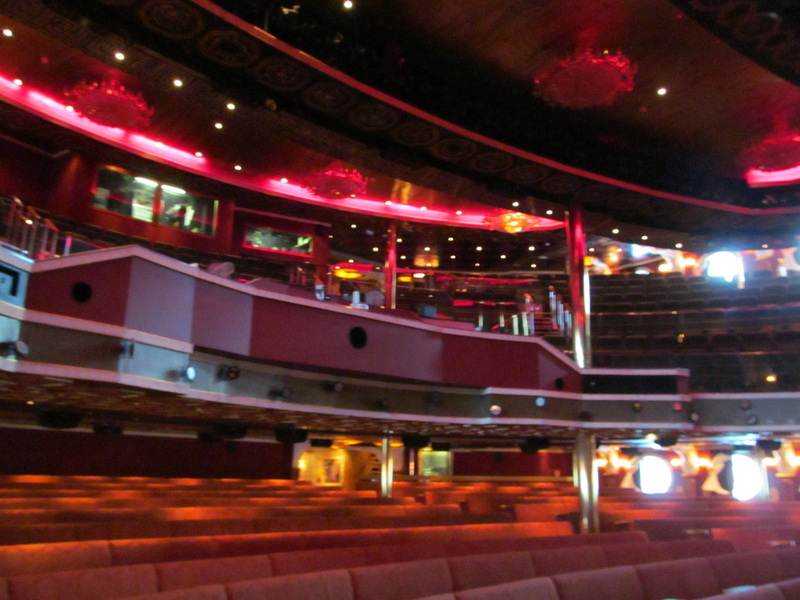 Dr. Frankenstein's is a multi story dance club on the Carnival Miracle. 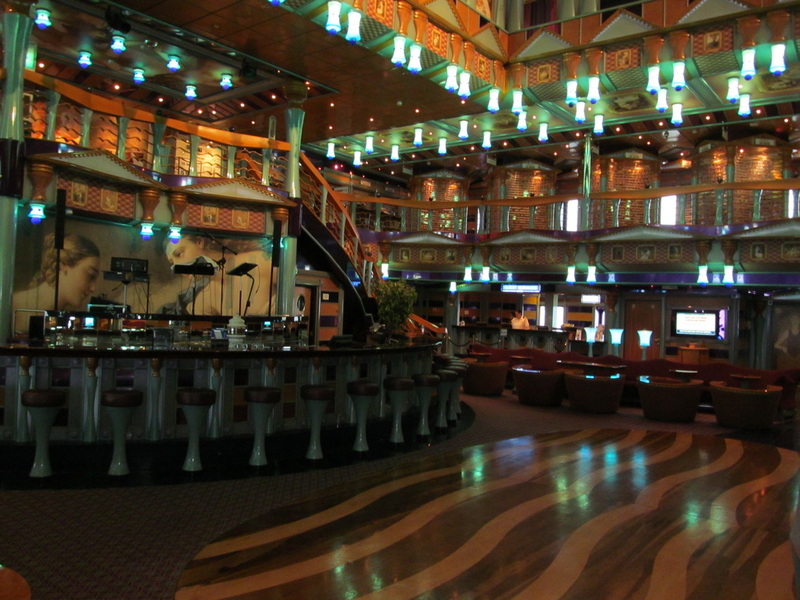 This dance club is located on the Riviera Deck (1) and the Promenade Deck (2) at the aft of the ship. 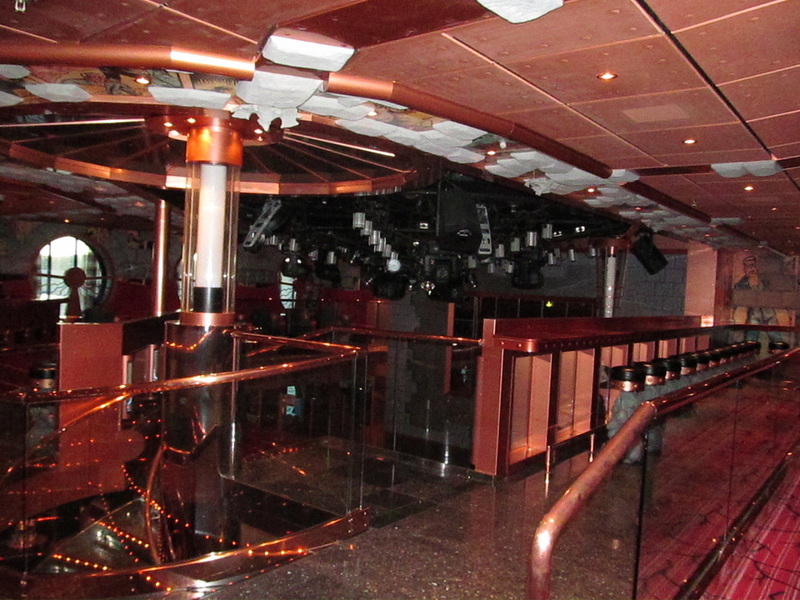 If I remember correctly the only entrance to Dr. Frankenstein's Lab Dance Club is on the Promenade Deck (2). 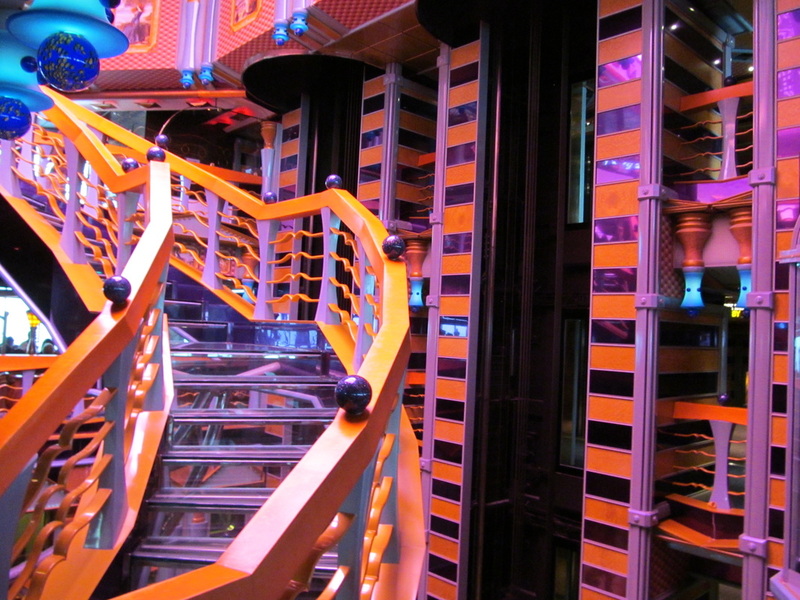 If you are planning on going to an evening disco you might want to find out where the entrance is before you try to go to the wrong deck. 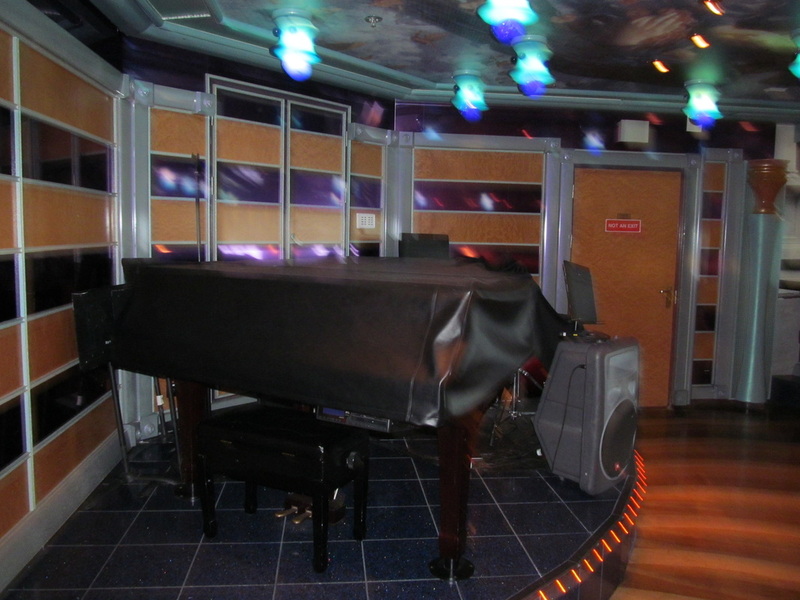 For a photo that shows the bottom level of Dr. Frankenstein's Lab Dance Club look to the left. 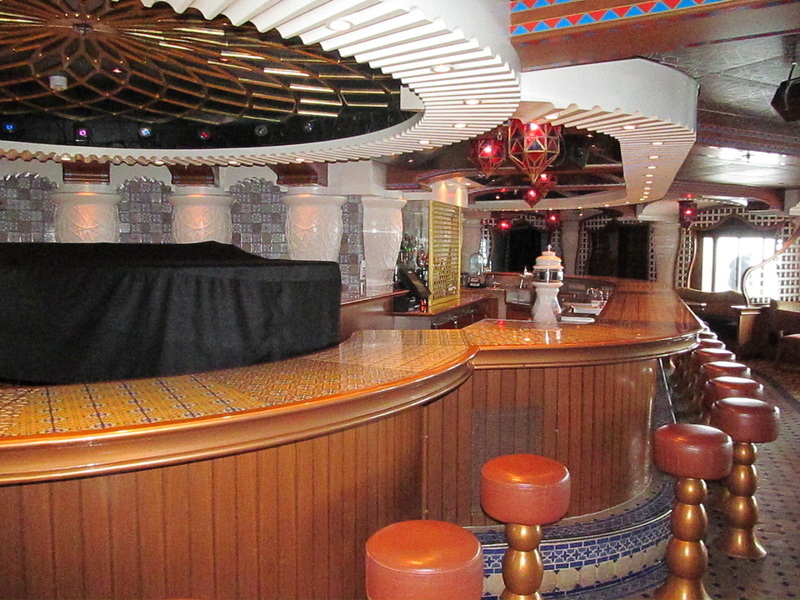 I will be sharing photos of the second story of the dance club in the Deck 2 section. 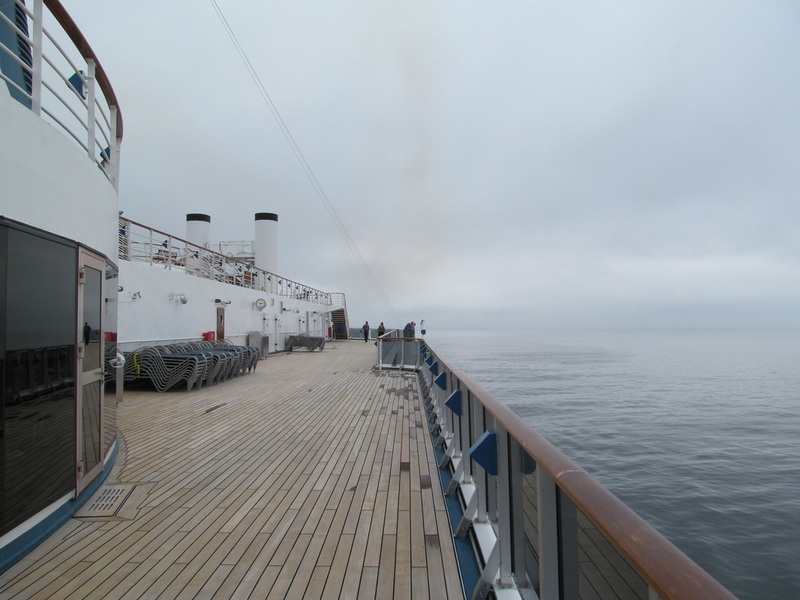 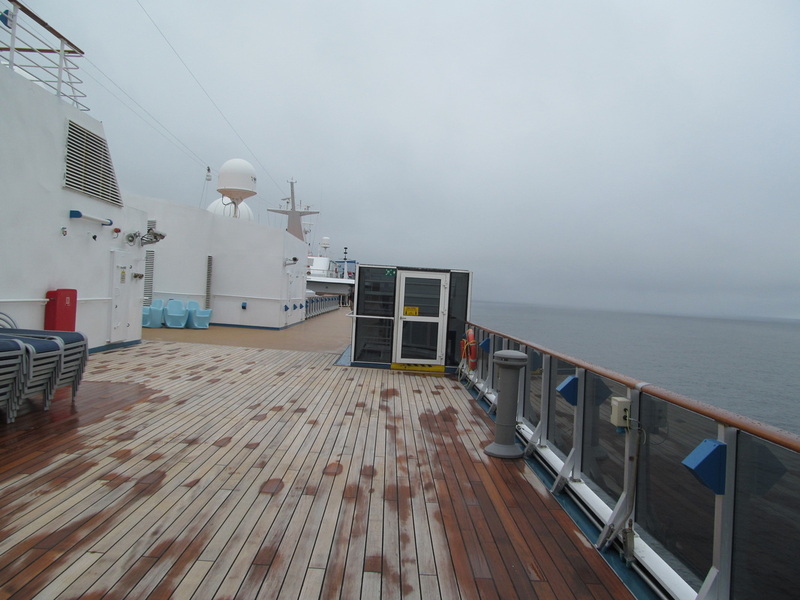 The Promenade Deck (2) is directly above the Riviera Deck (1) and below the Atlantic Deck (3). 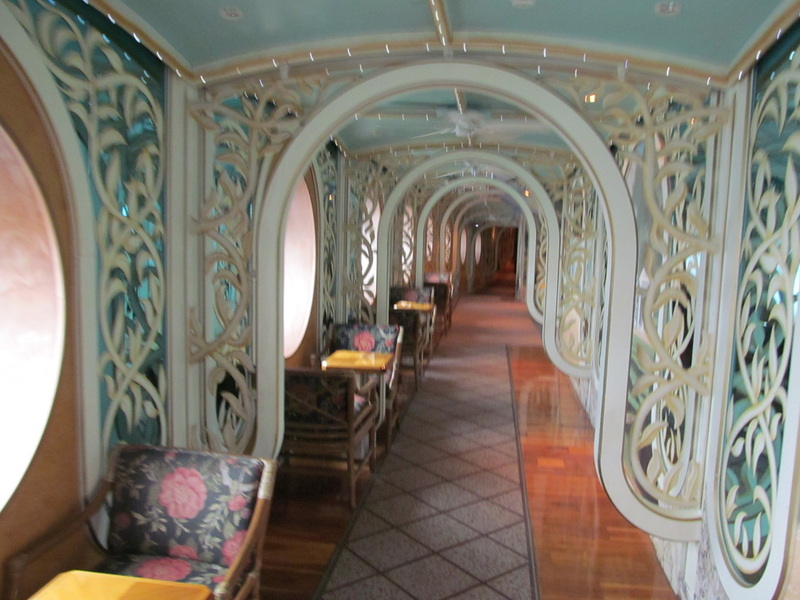 The Promenade Deck is a deck that does not contain any guest staterooms which means that almost the entire deck has public areas for guests. 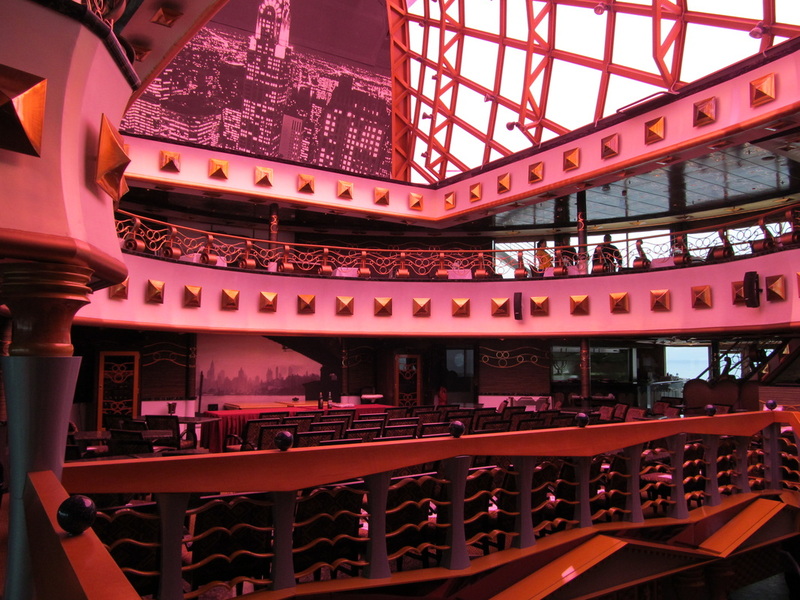 On this deck you will find onboard places such as the Phantom Lounge, the Jazz Club, Fountainhead, Casino, Atrium, Jeeves, and the Bacchus Dining Room. 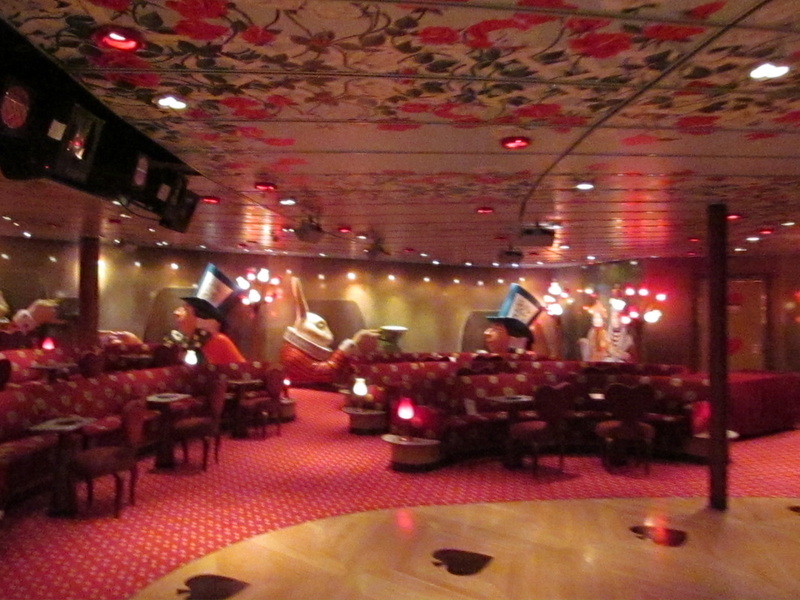 The Phantom Lounge is the Carnival Miracle's main show lounge & theatre. 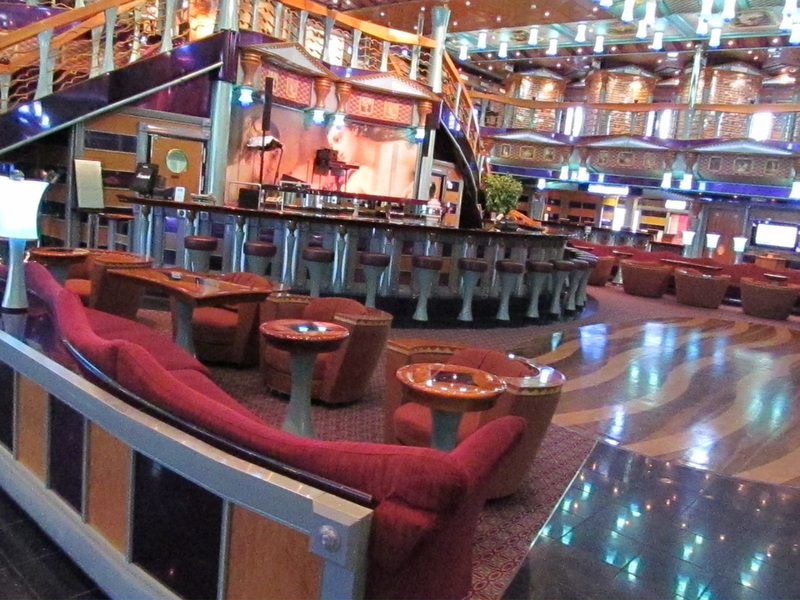 In this lounge is where the production shows and some other activities occur. 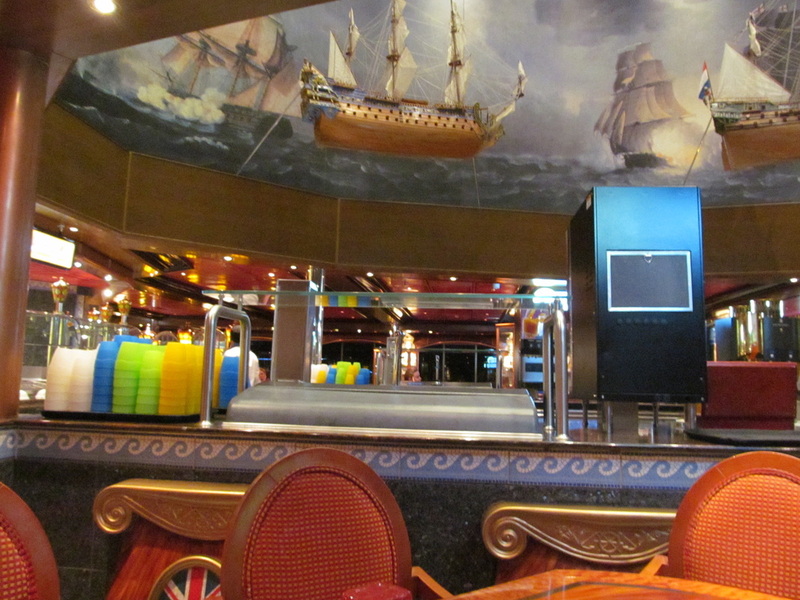 The Joker's Card Room is the Carnival Miracle's onboard card room. 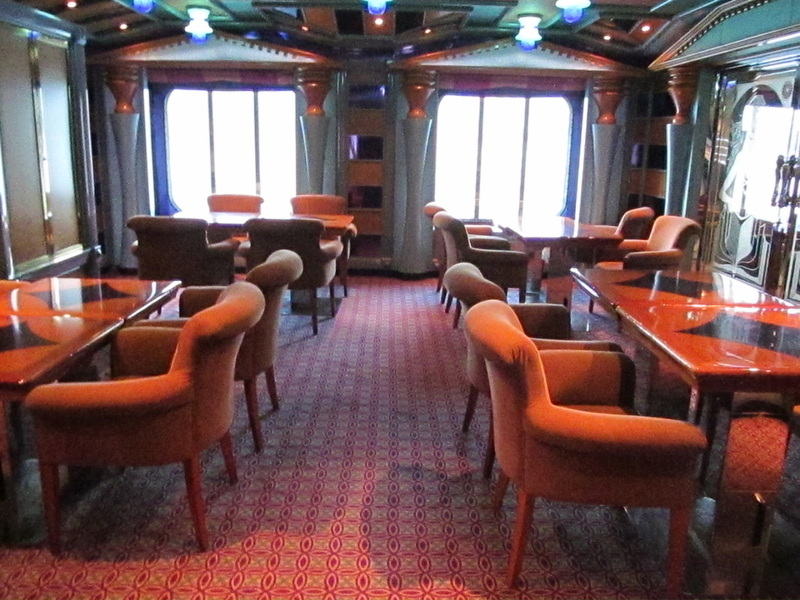 Basically this room is a few tables and chairs with an ideal setup for playing a board game or a game of cards. 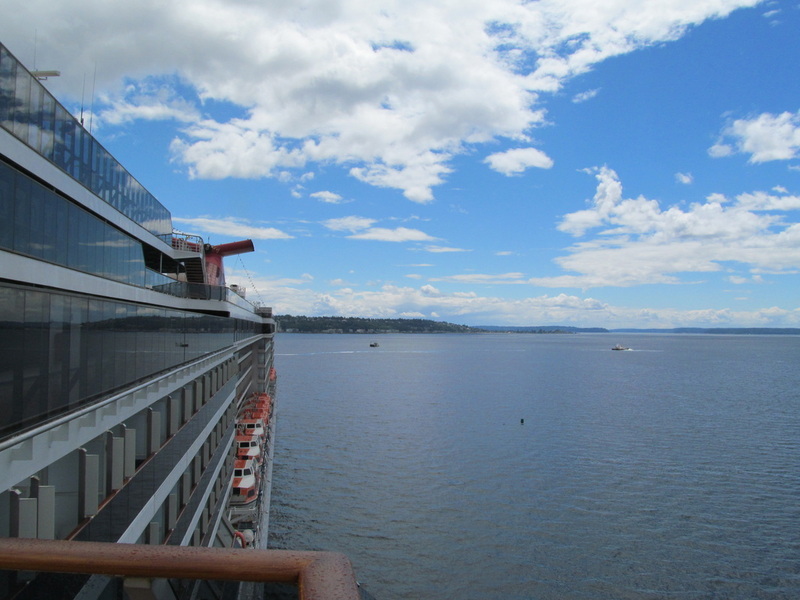 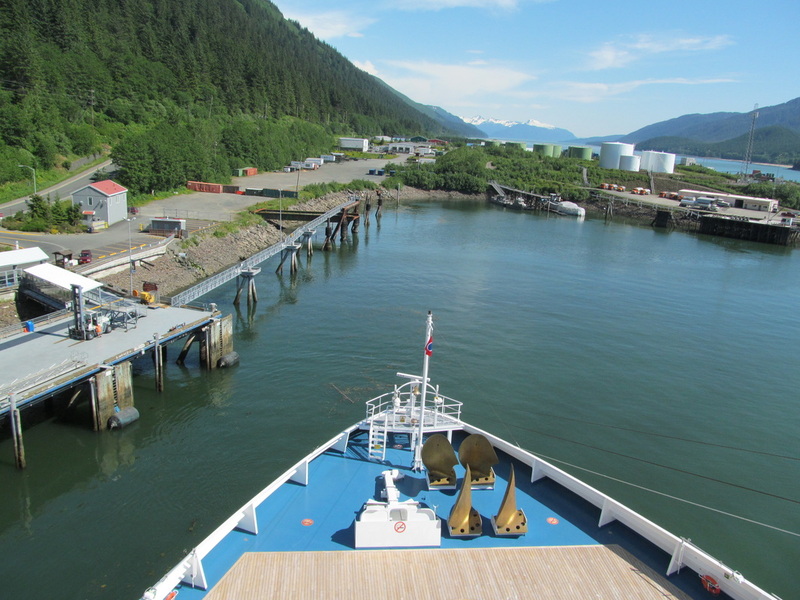 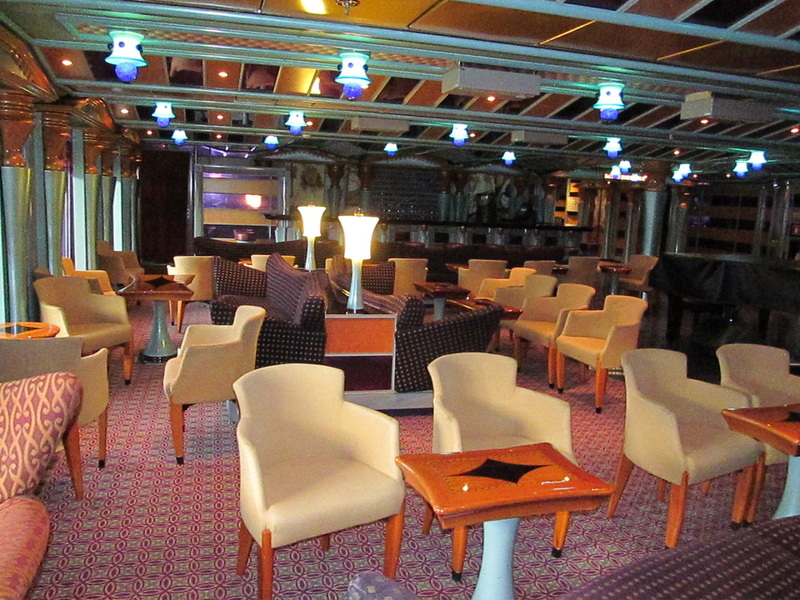 Throughout my 2013 Alaska cruise this room was busy with people playing games and cards. 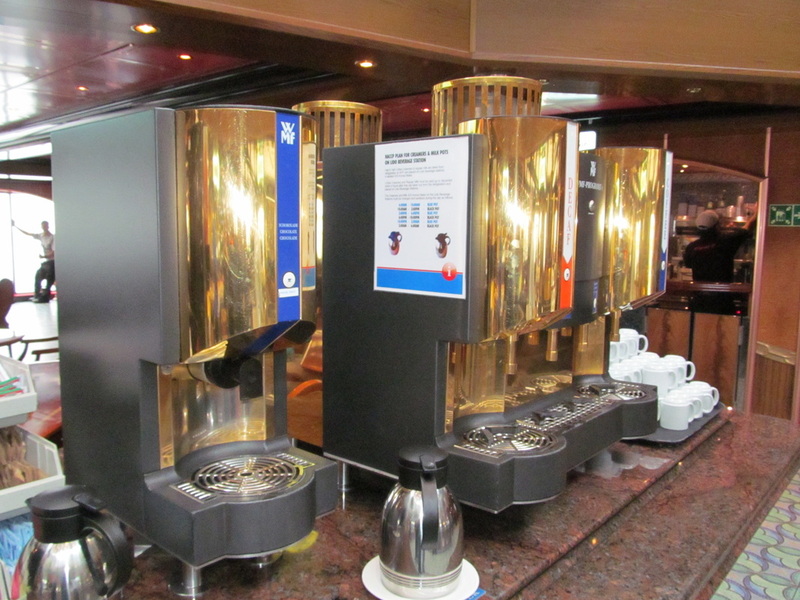 I was able to get the picture that I have to the left on the last morning of the cruise before getting off. 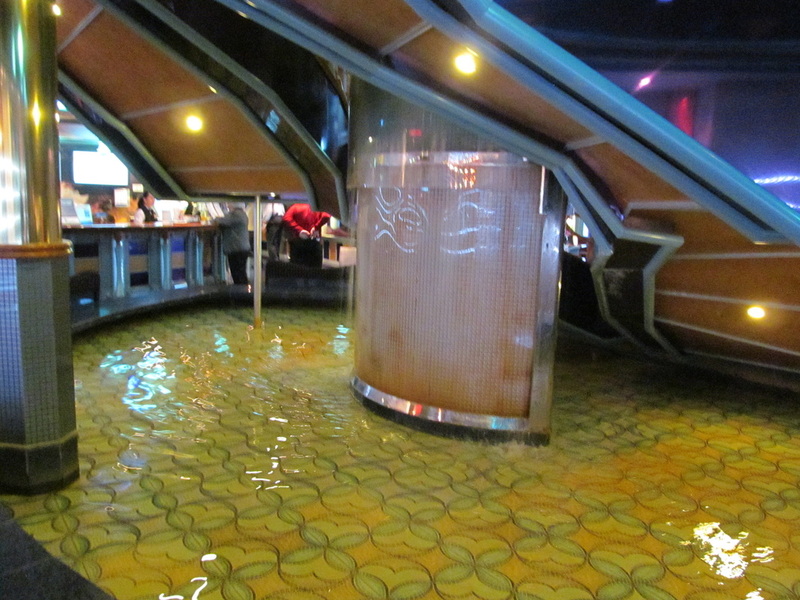 The Fountainhead is an area in the front of the promenade that has many seats and a fountain onboard. 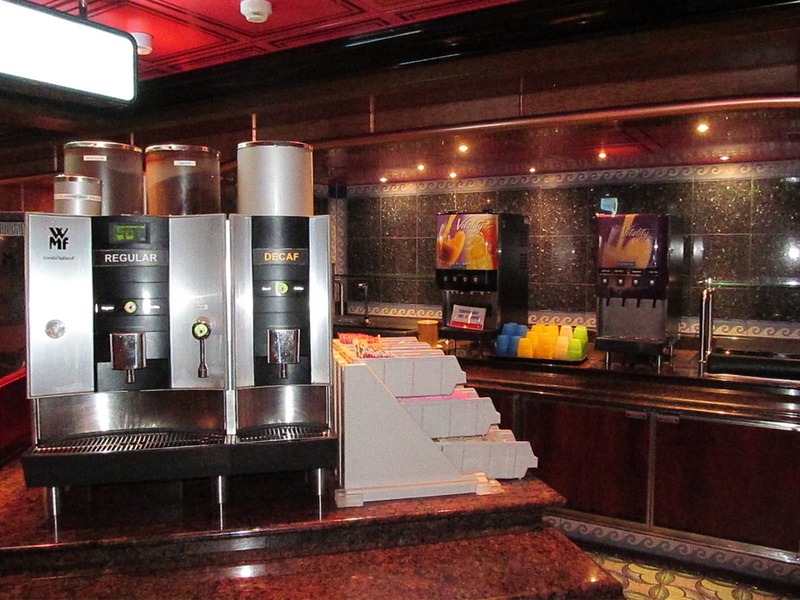 A part of the Fountainhead area of the promenade is a coffee café that serves coffee and sweets at an additional cost. 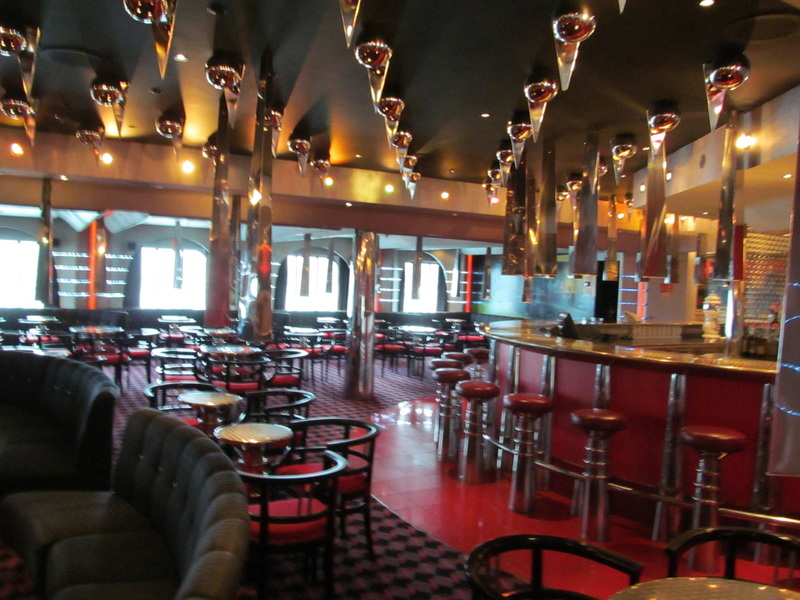 Here are a few pictures of the Fountainhead sitting area and café. 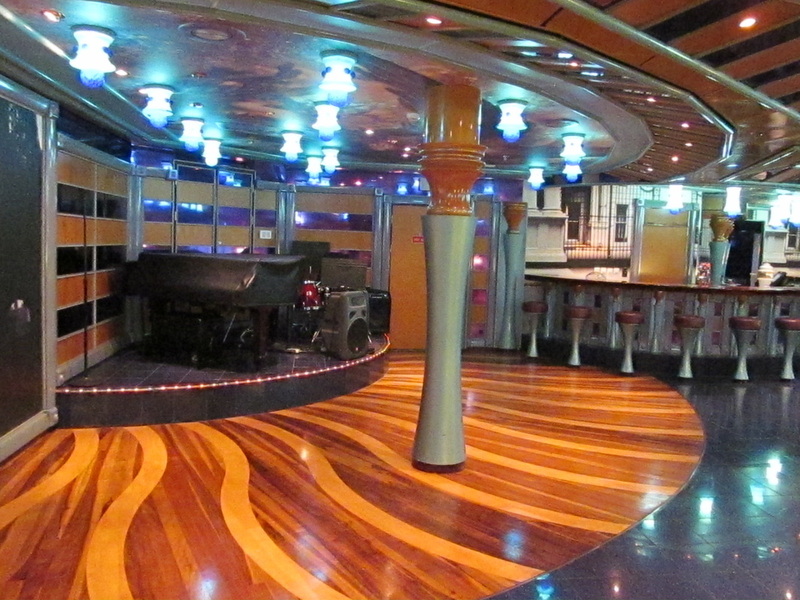 The Jazz Club is a lounge on the Carnival Miracle that has a large space for a dance floor, a bar, and many tables & chairs. 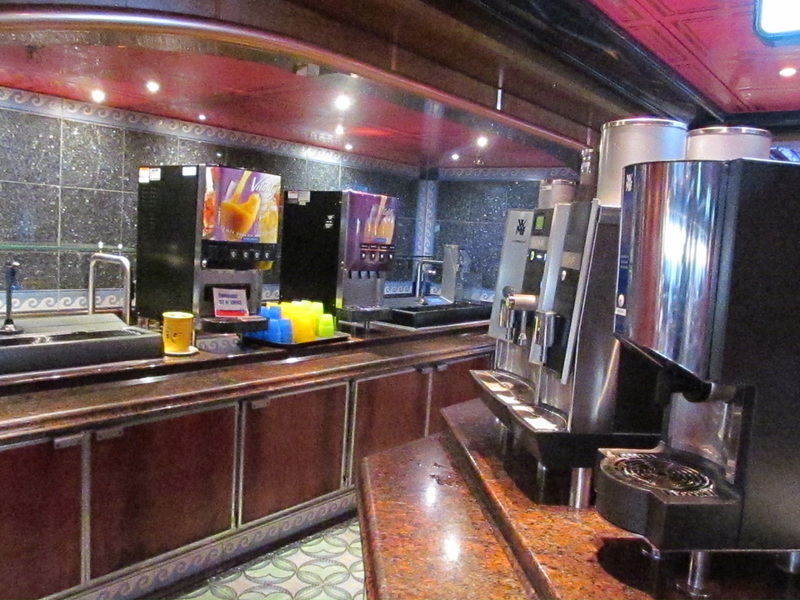 Maguire's Sports Bar is the Carnival Miracle's sports bar. 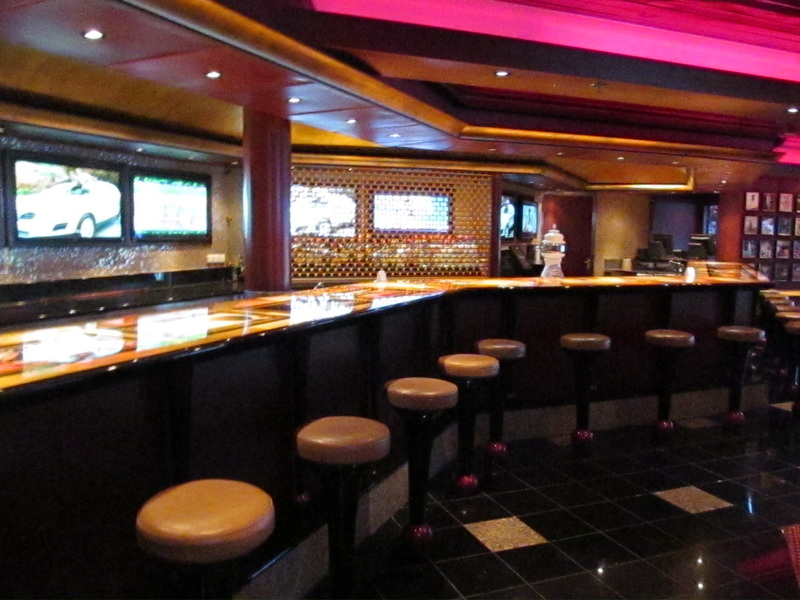 Typically in the sports bar there are televisions or screens showing a sports game. 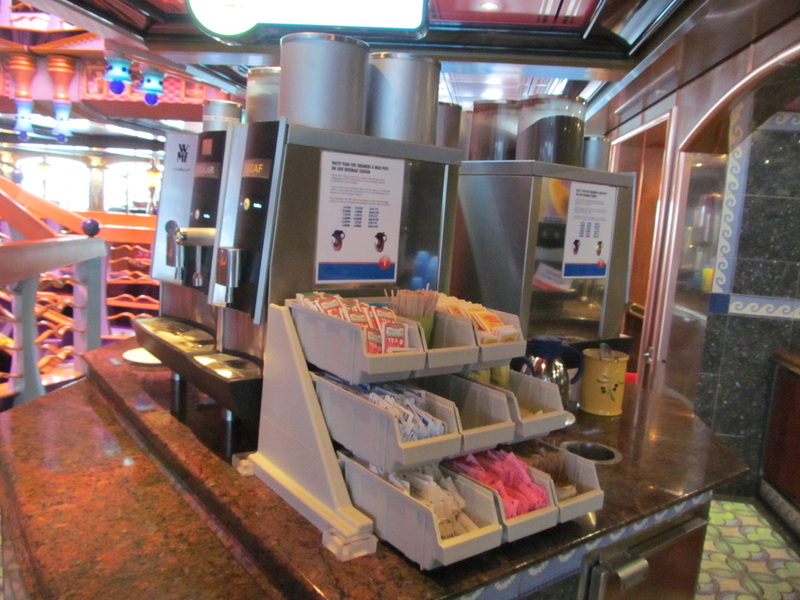 The Fun Finds Shopping Desk is where you can get port of call shopping information. 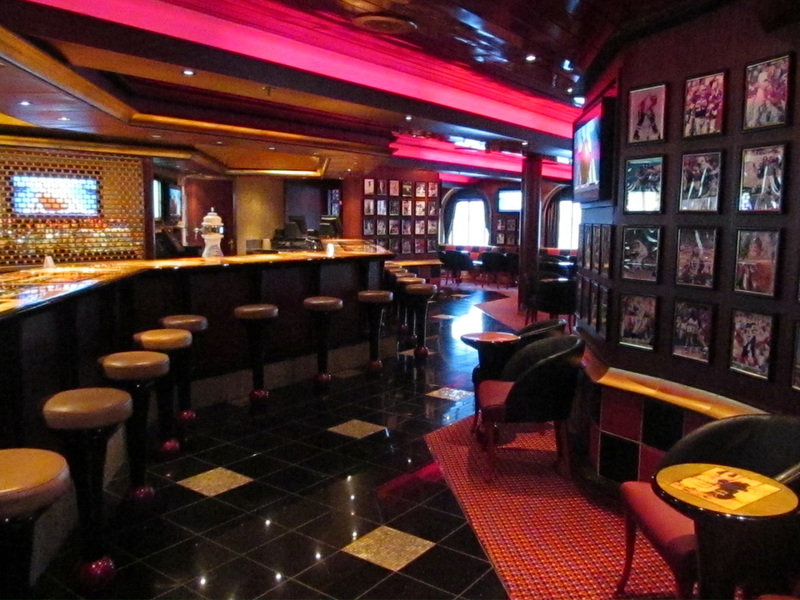 This desk is located directly next to the sitting area in the Fountainhead. 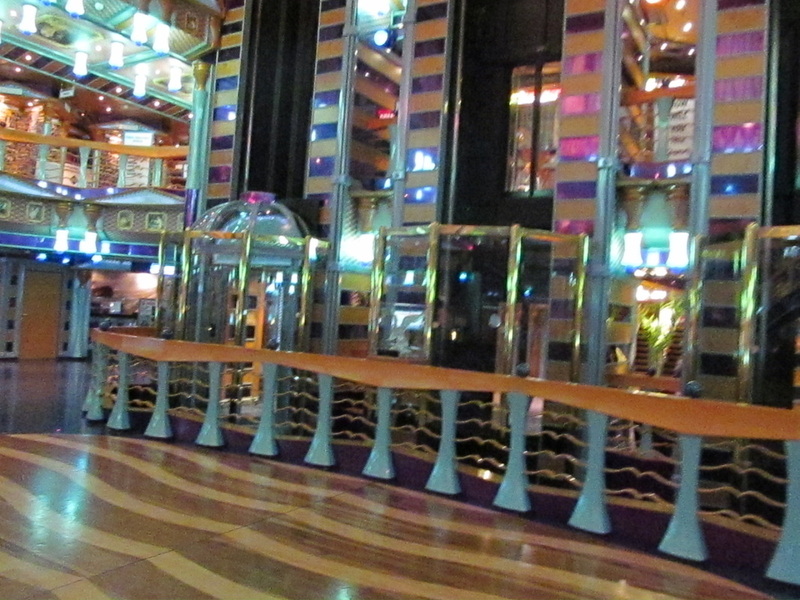 The Future Cruise & Loyalty Desk is located near the Fun Finds Shopping Desk, but is right next to one of the entrances to the casino area/walkthrough. 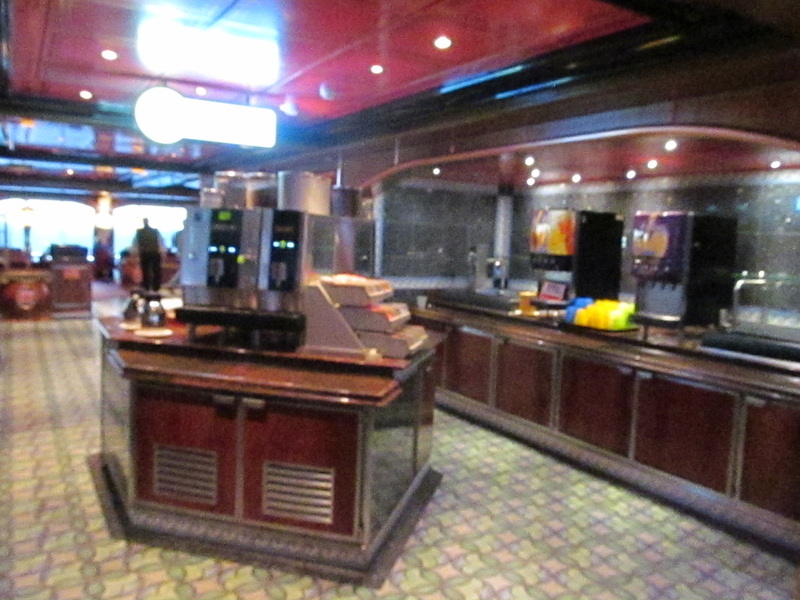 This desk is where people can learn more about future cruises and sign up for a Carnival credit card. 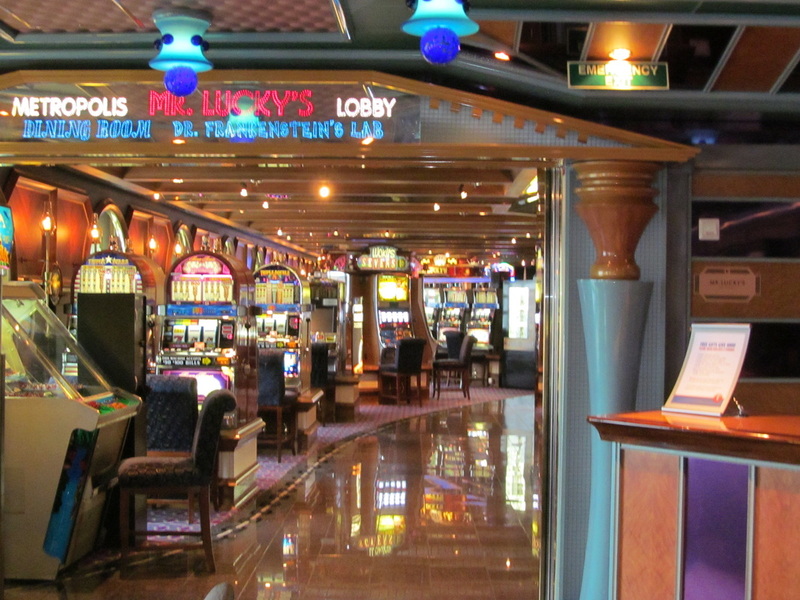 Mr. Lucky's Casino is the Carnival Miracle's casino. 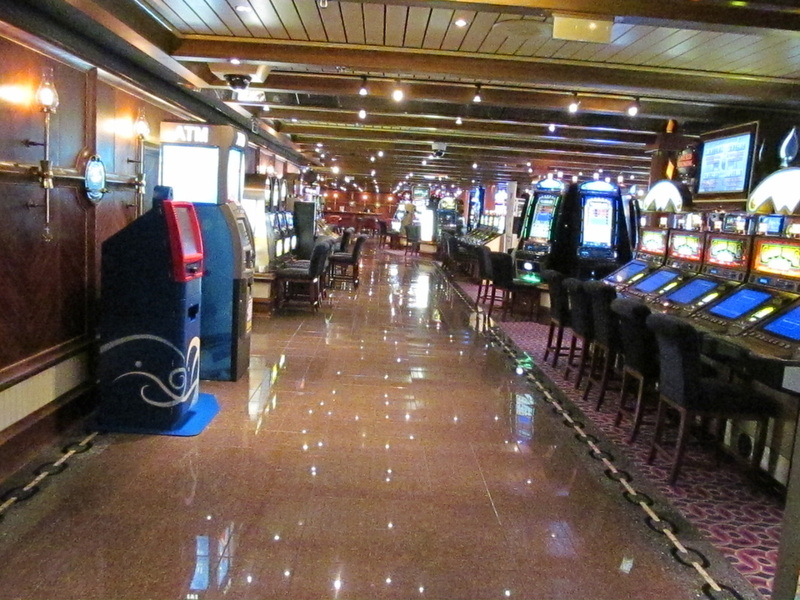 The casino is located towards the mid-front of the Promenade Deck. 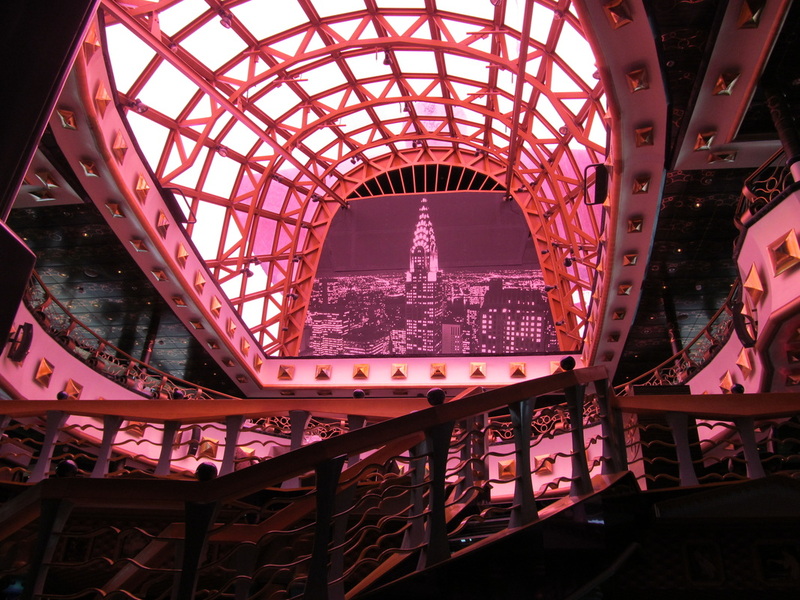 The casino has a walkway in the middle, but if you want to get from the front to back of the ship without cutting through the casino you will have to choose a different deck. 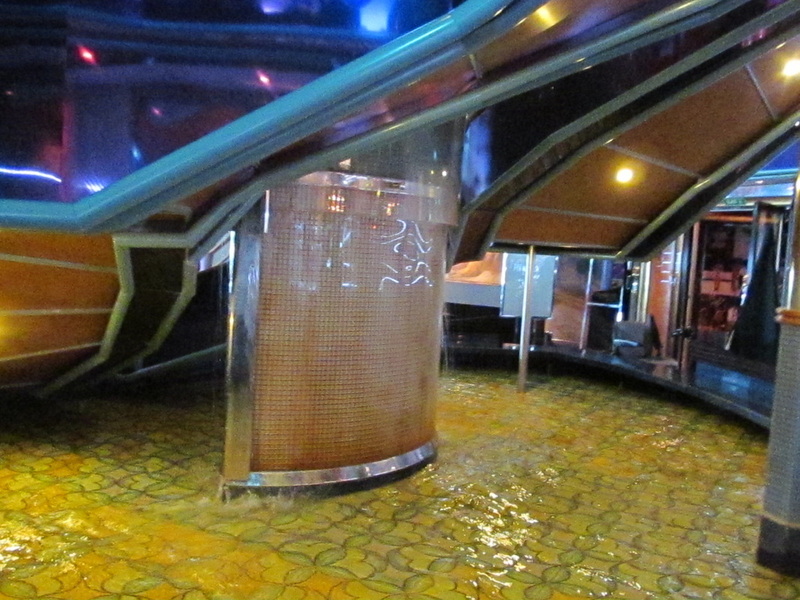 Although children are not allowed in the casino they can probably walk through this walkway as long as they are with an adult and do not stop in the casino. 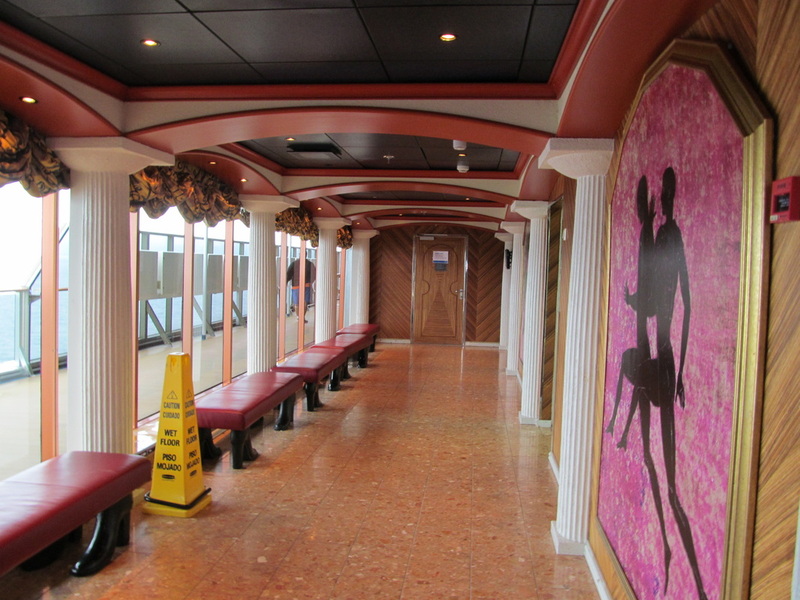 There was no indication during my cruise that children were not welcome to walk across this walkway, but there could be a rule that I am unaware of. 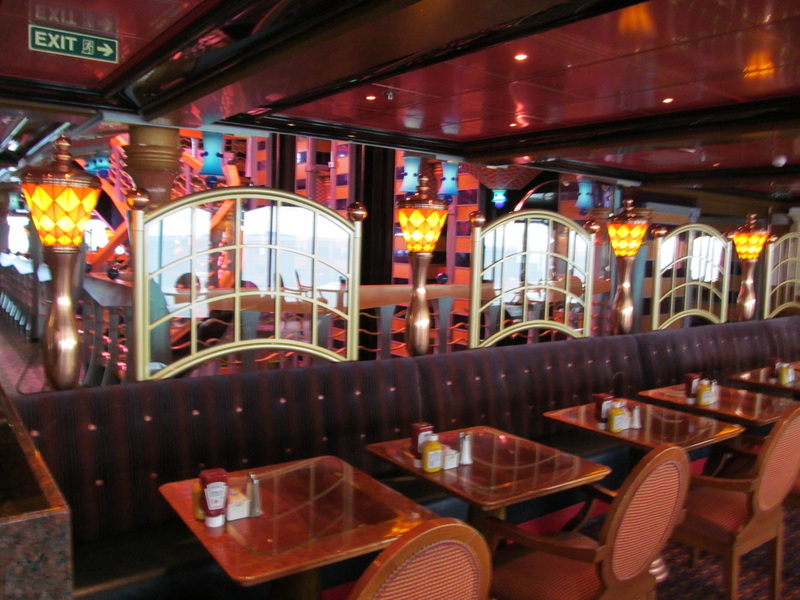 The Jeeves Lounge is a place with many seats that is located towards the back of the Promenade. 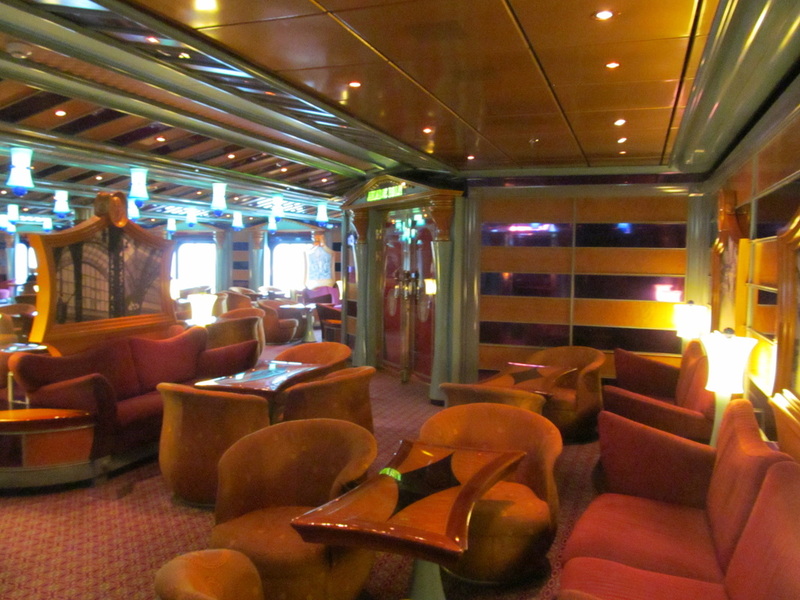 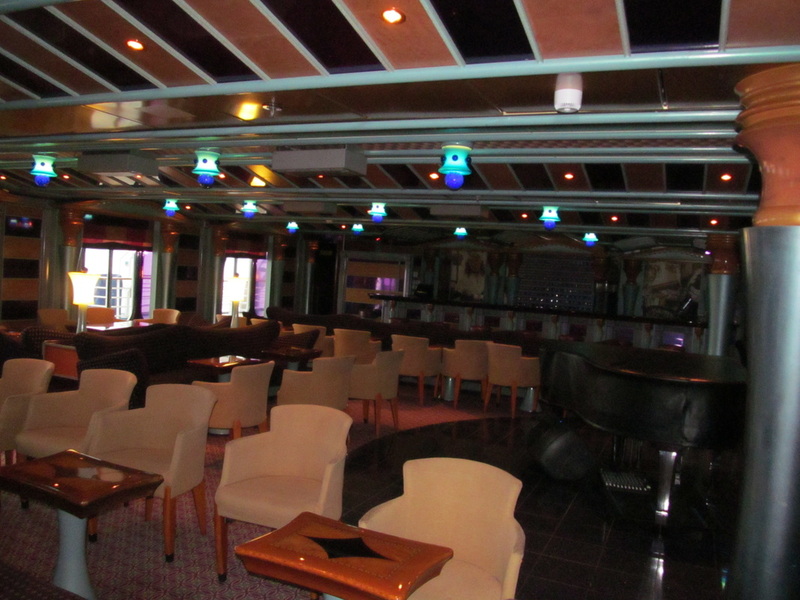 The second story of the dance club is located on the Promenade Deck in the Jeeves Lounge area. 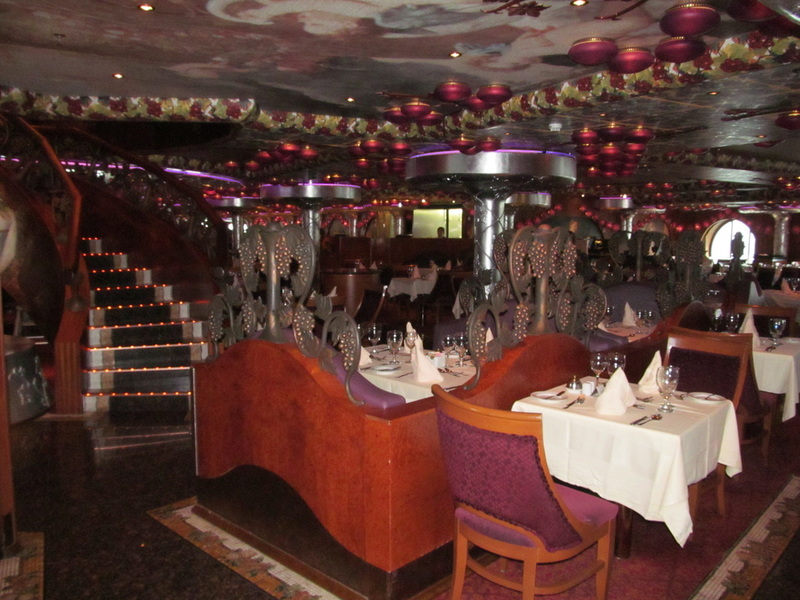 The aft of the Promenade Deck contains the first level of the Bacchus Dining Room, which is the Miracle's main dining room. 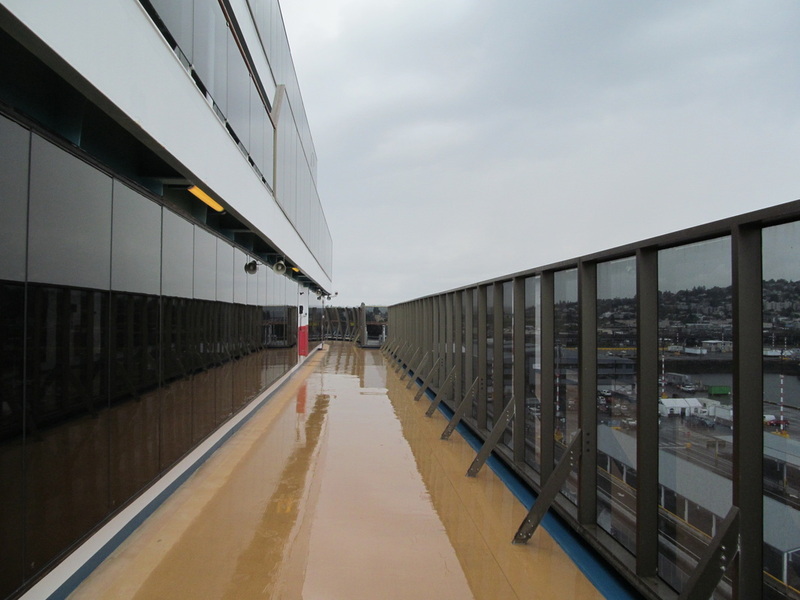 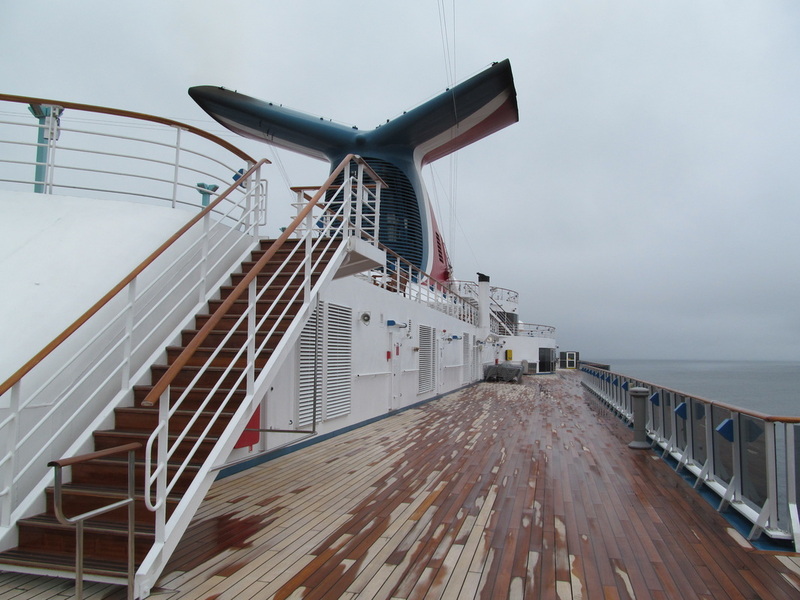 The Atlantic Deck (3) is located directly above the Promenade Deck (2) and below the Main Deck (4). 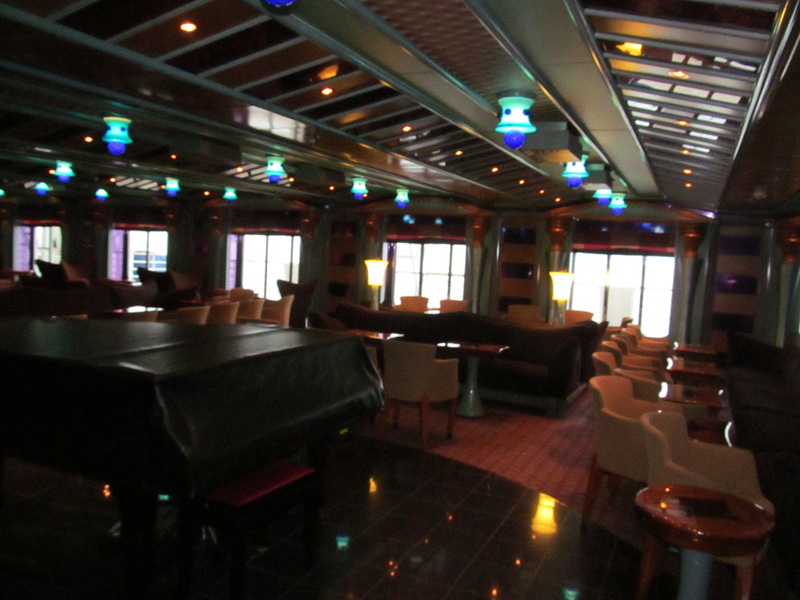 This deck includes the ship's library and internet café, a chapel, piano bar, the photo gallery, the upper level of the dining room. 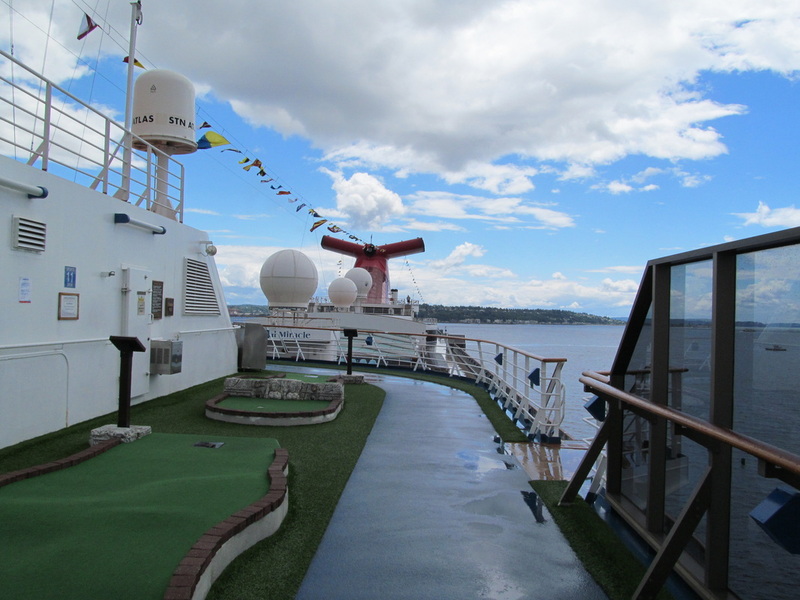 Please note that there are more attractions on this deck that I did not include in this deck preview. 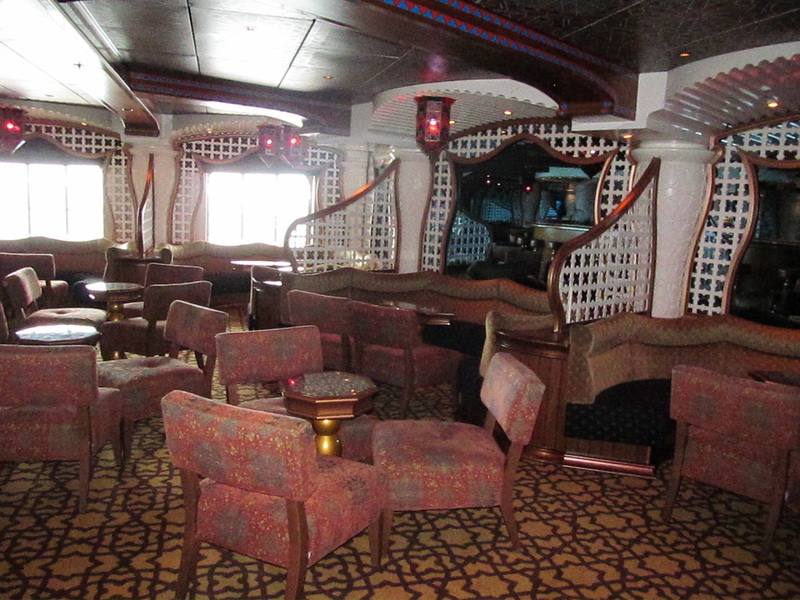 The Phantom Lounge is the Carnival Miracle's main show lounge & theatre. 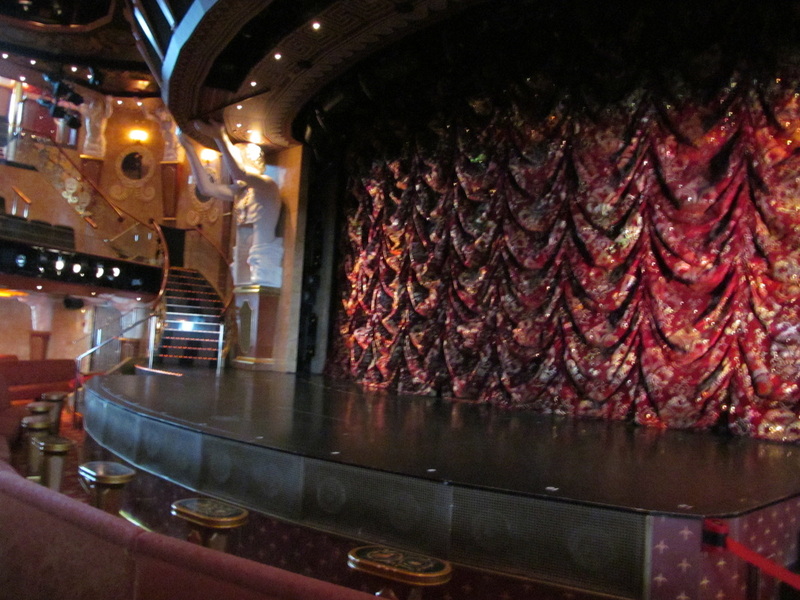 The Atlantic Deck contains the second level of the show lounge. 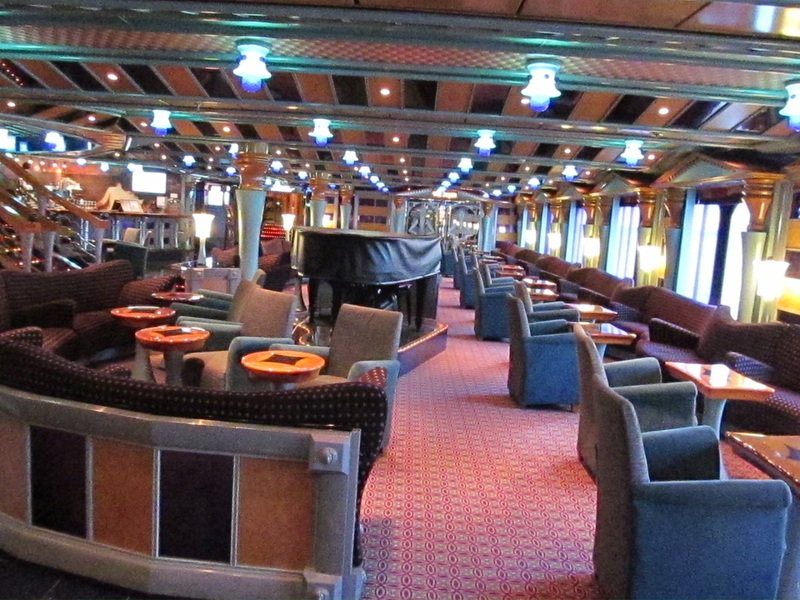 There is a third level of the Phantom Lounge that is located on the Main Deck (4). 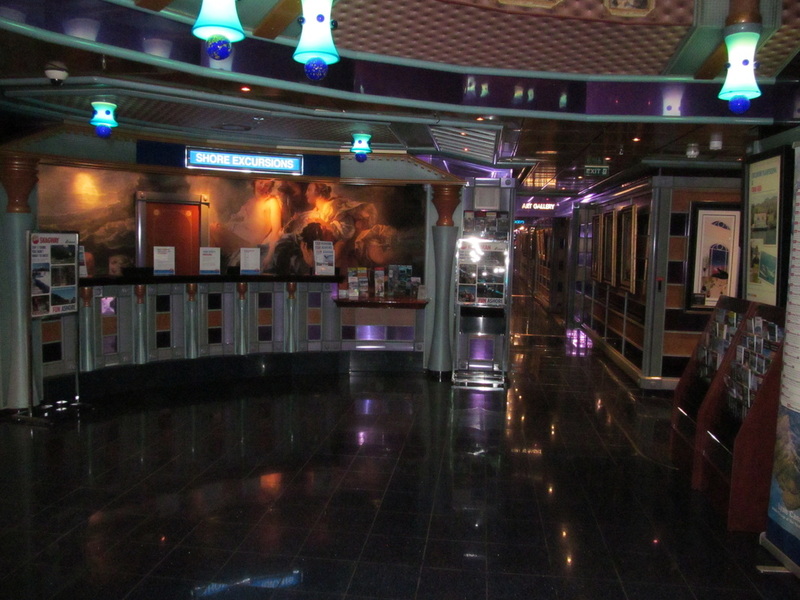 This is the best photo I have to represent this floor of the theatre. 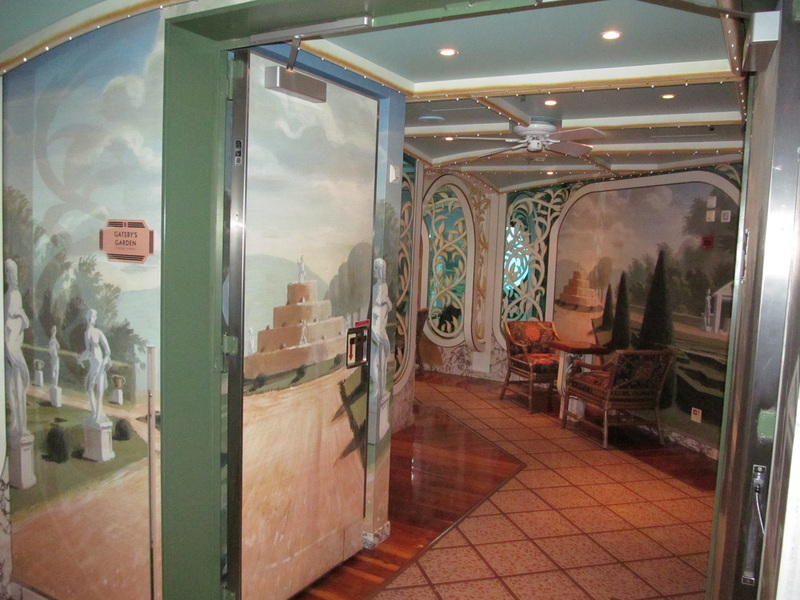 Gatsby's Garden is an interior promenade area that loops through and around the second floor of the Phantom Theatre. 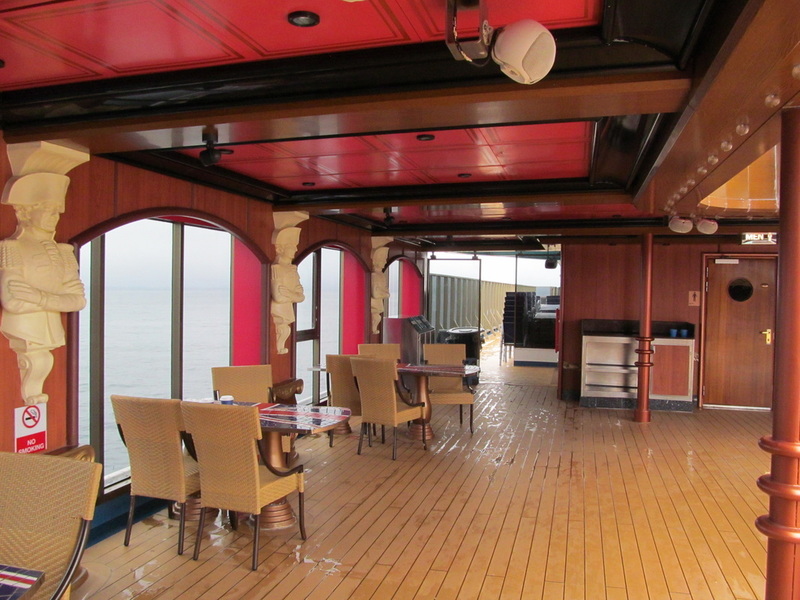 According to Carnival's deck plan this is the "interior promenade". 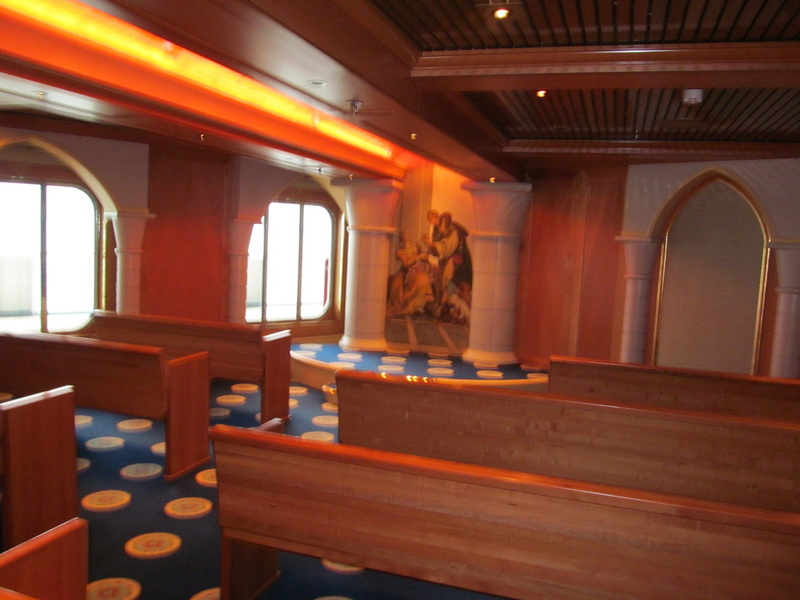 The Carnival Miracle has an onboard chapel that is located on the Atlantic Deck Port Side. 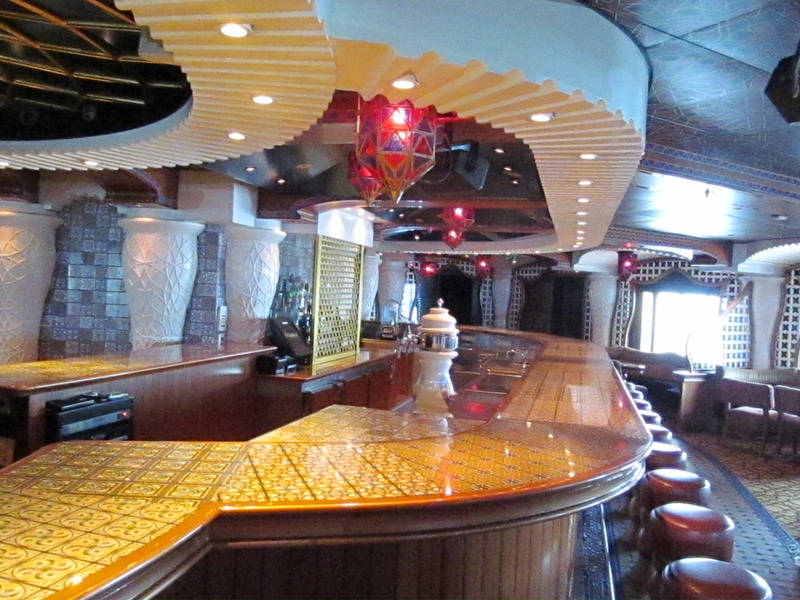 Sam's Piano Bar is the Carnival Miracle's piano bar. 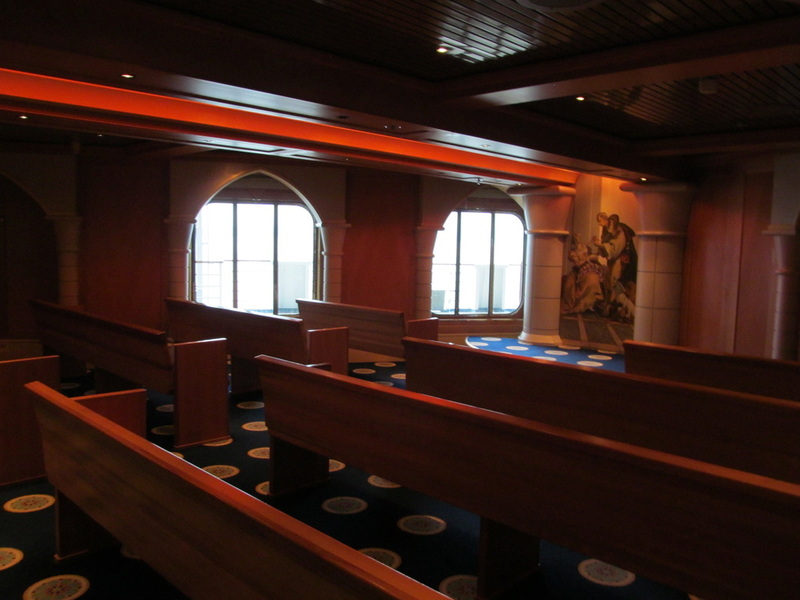 The entrance is located on the port side of the ship next to the chapel. 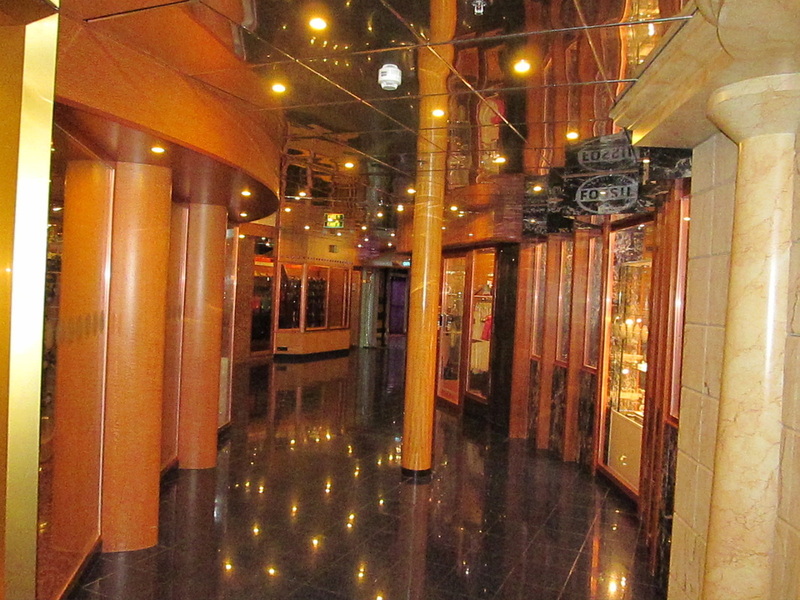 The gift shops onboard are located on the Atlantic Deck near the middle/front of the ship. 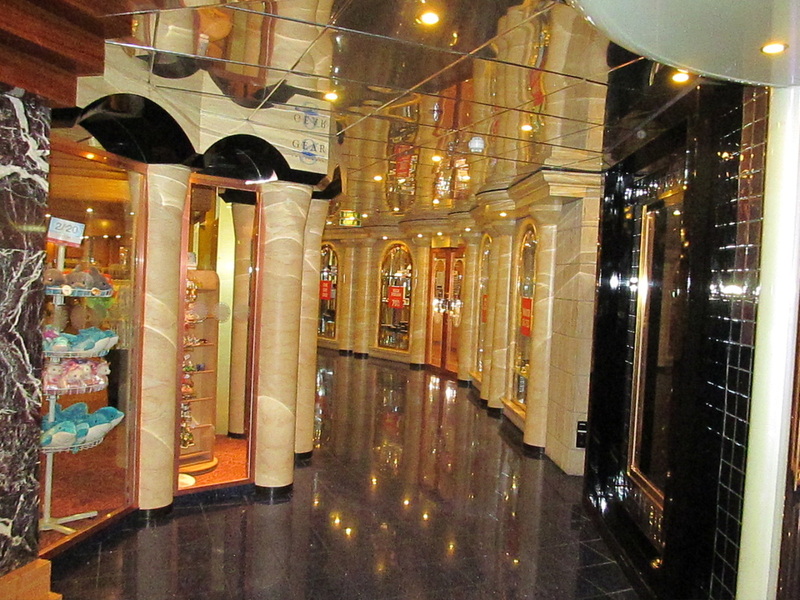 The shops are also known as the Yellow Brick Road. 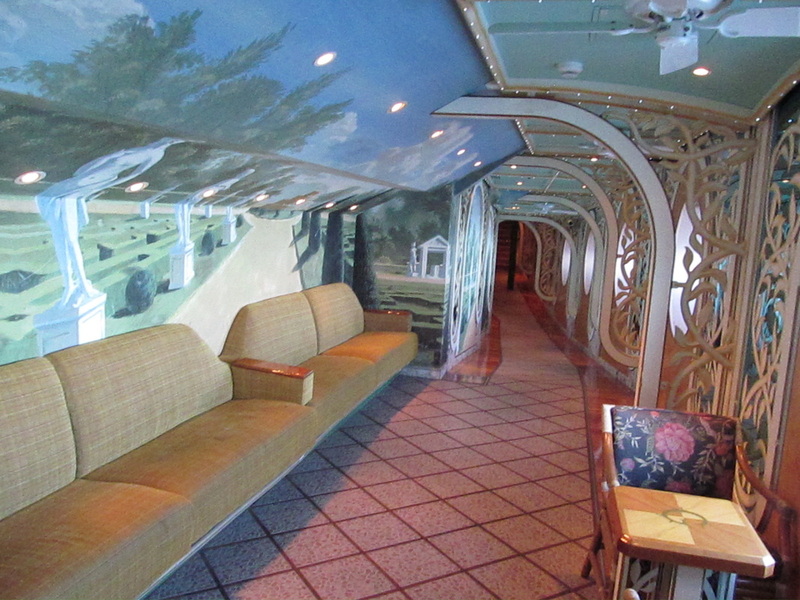 The Yellow Brick Road is a walkway with gold walls and windows into the gift shops. 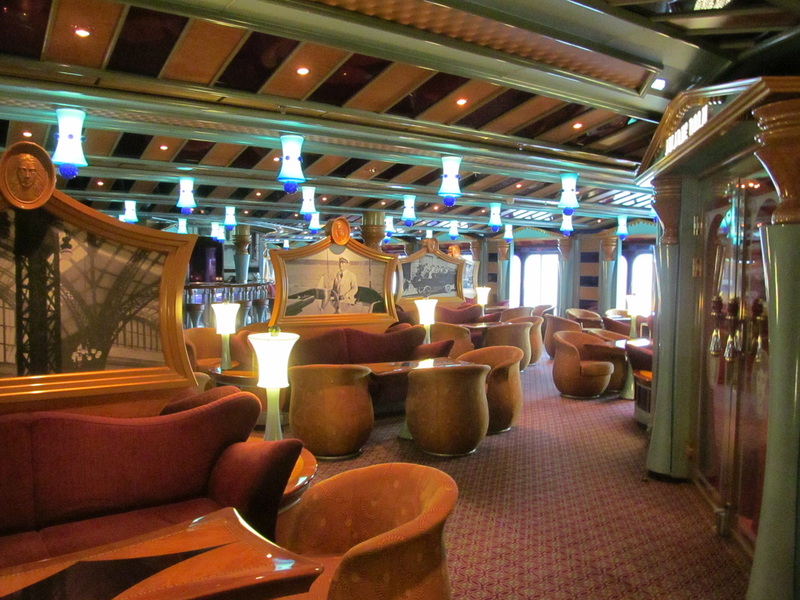 The Gotham Lounge is located near the aft of the Atlantic Deck before the entrance to the second level of the Bacchus Dining Room. 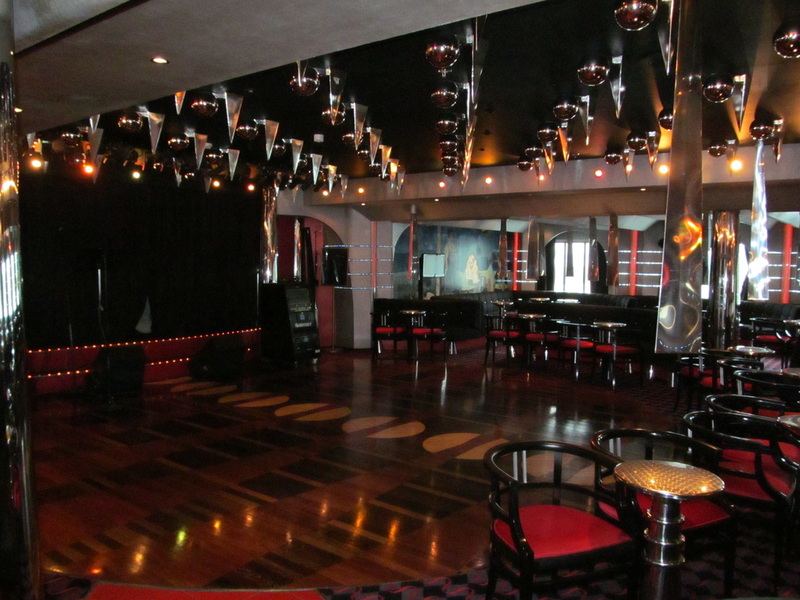 The Gotham Lounge is an open space that consists of many tables, chairs, and a bar. 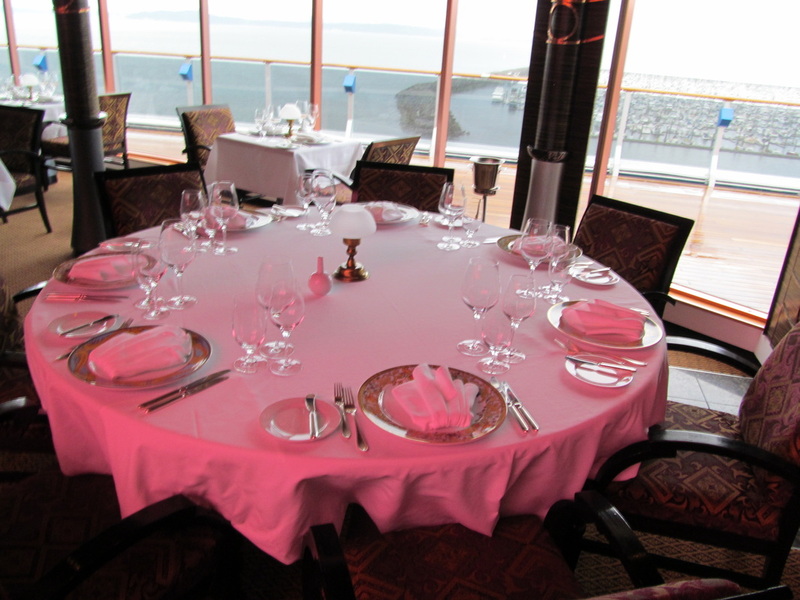 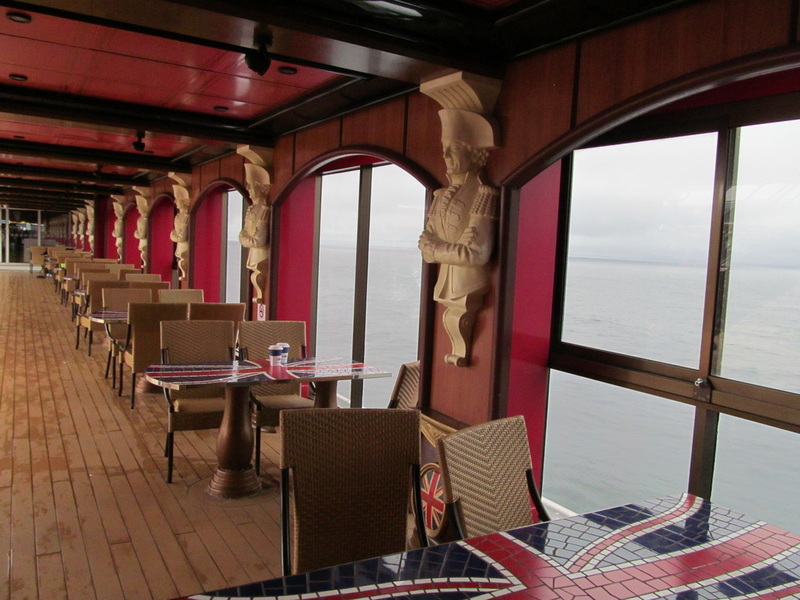 The second floor of the Bacchus Dining Room is on the Atlantic Deck. 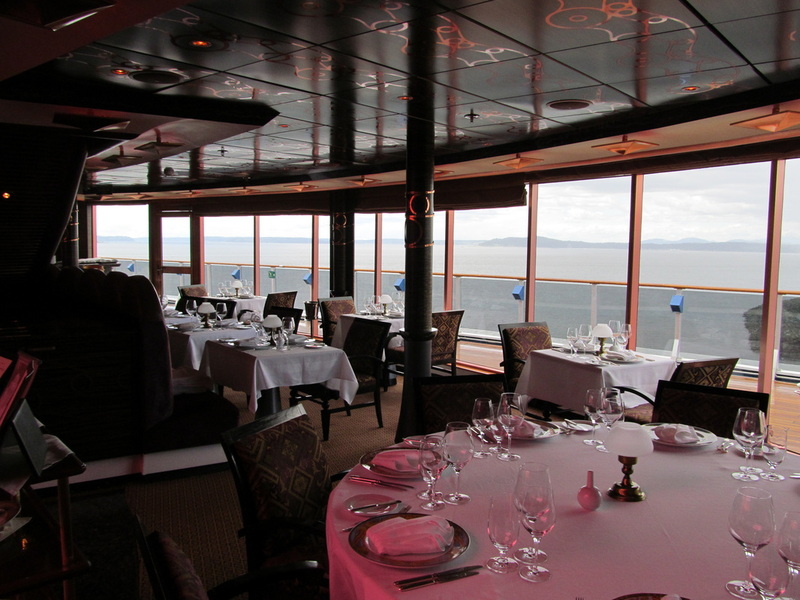 This deck of the dining room has an open area that people can look down on the floor below. 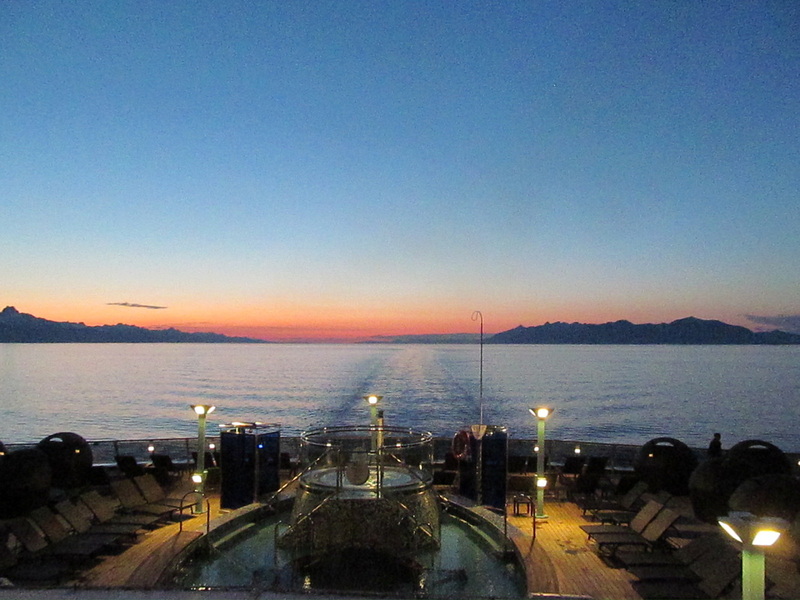 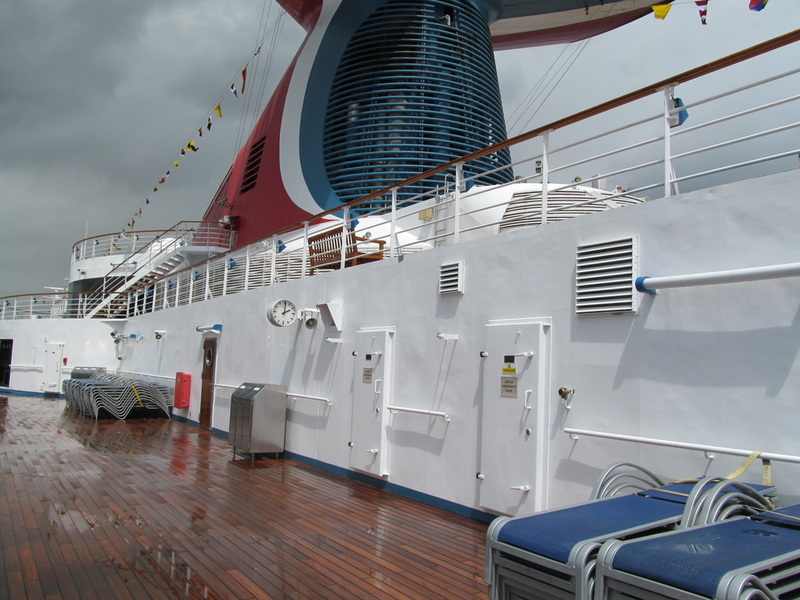 The Lido Deck (9) is located directly above the Panorama Deck (8) and below the Sun Deck (10). 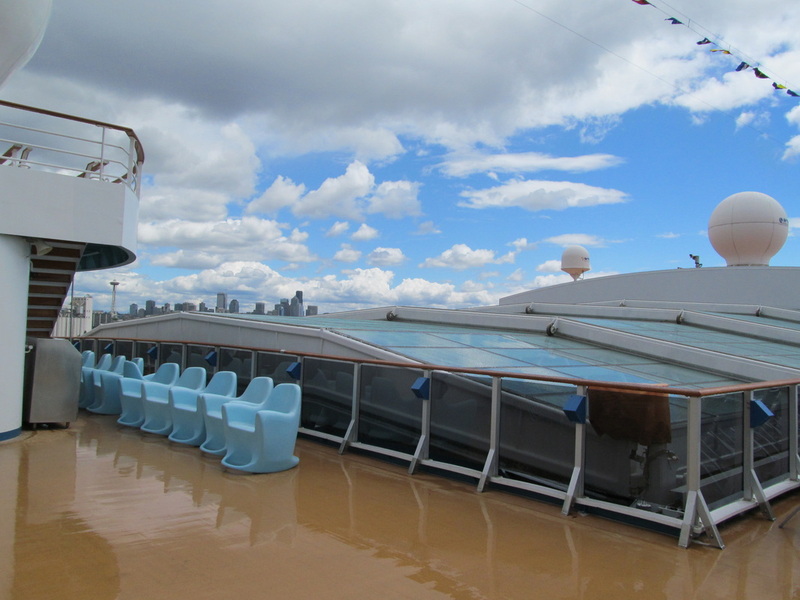 The Lido Deck has a nice open deck that overlooks the front of the ship that is called the Observation Deck. 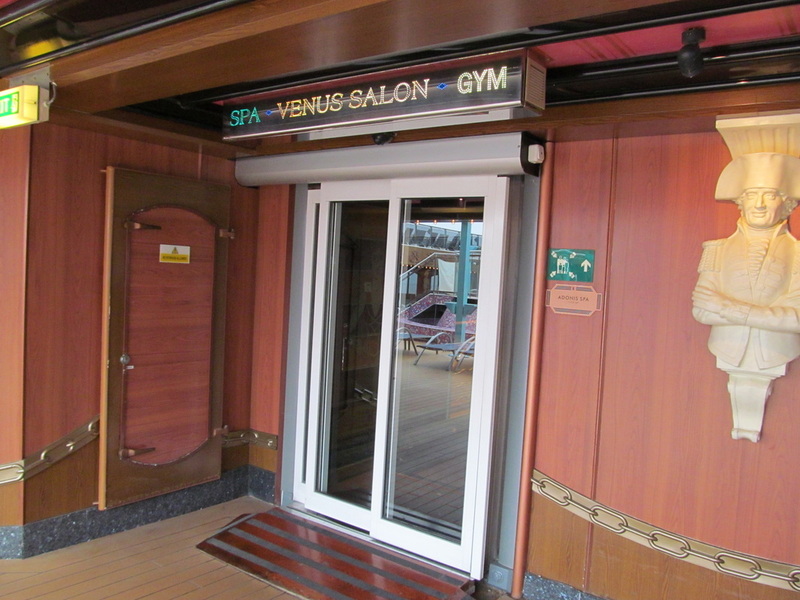 The spa and gym are on the Lido Deck in the front of the ship. 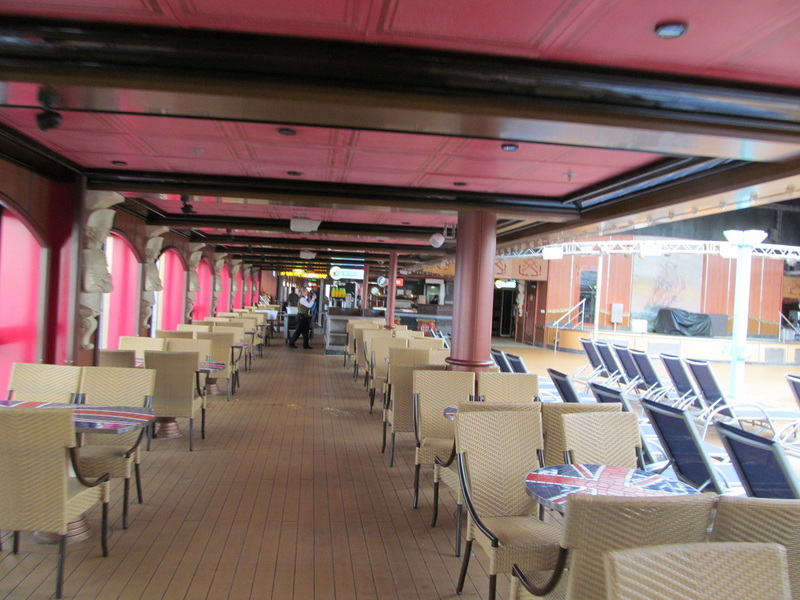 The Lido Deck contains the ships main pool areas and the lido buffet named Horatio's. 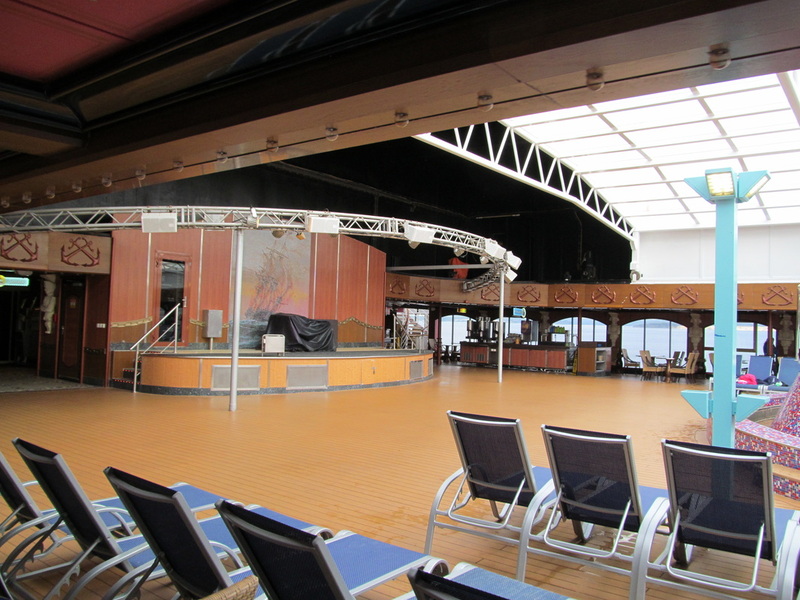 At the very back of the Lido Deck is the Serenity Deck, which is for adults only. 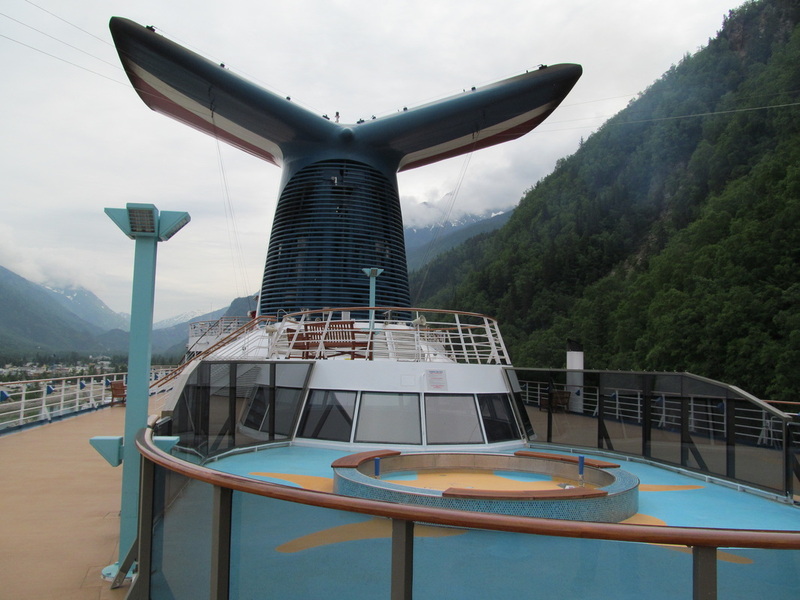 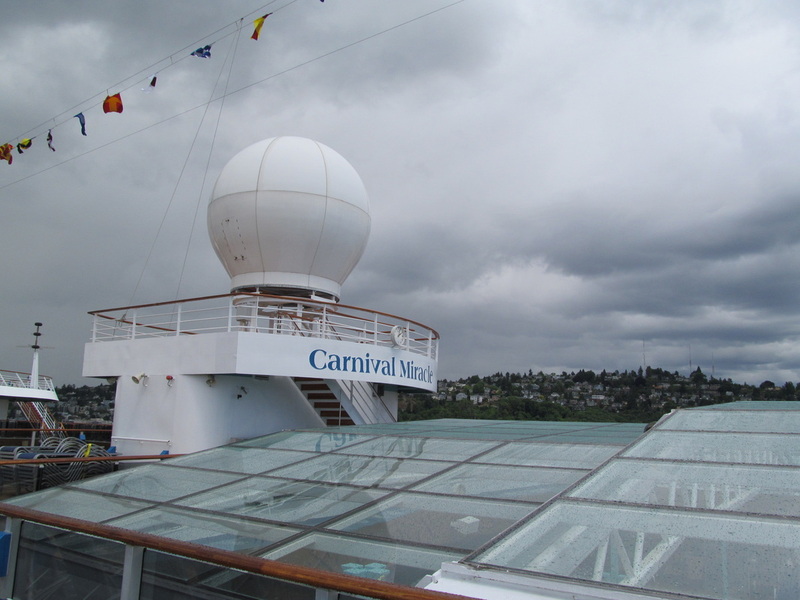 At the very front of the Lido deck there is an area that is referred to as the "Observation Deck". 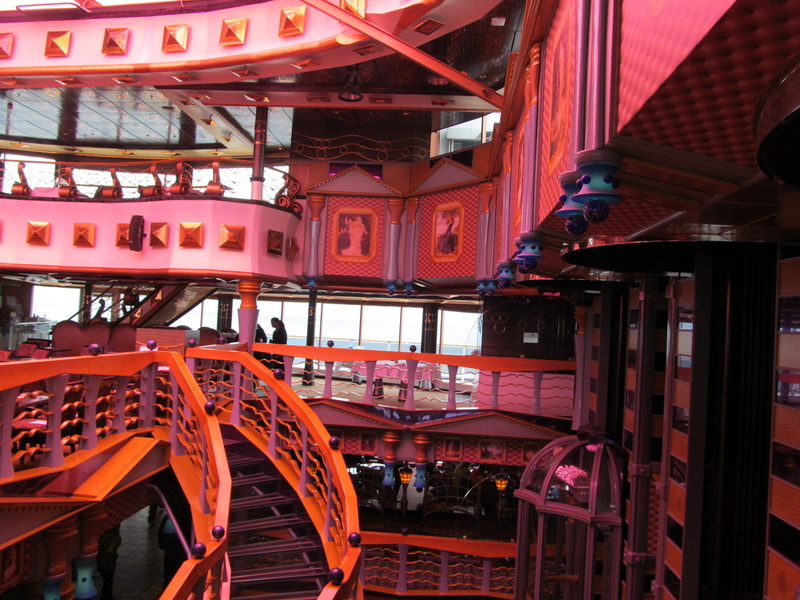 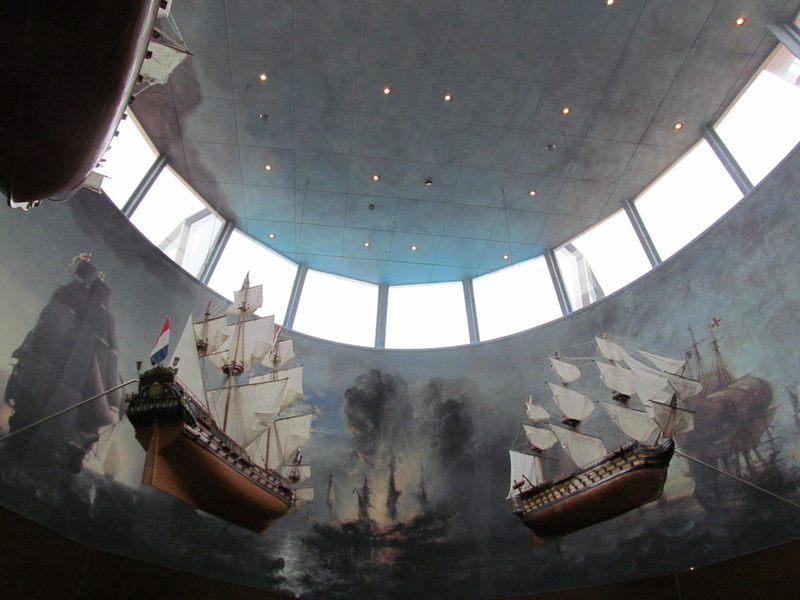 This area is located directly above the ship's bridge and allows guests to look below at the "mouth" of the ship and look down the ship's sides. 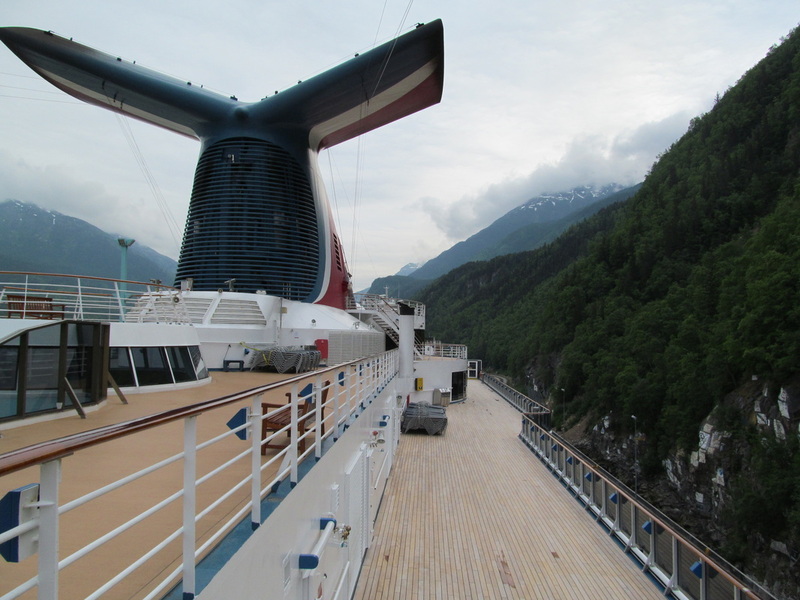 This area of the ship was my favorite spot for viewing scenery in Tracy Arm Fjord! 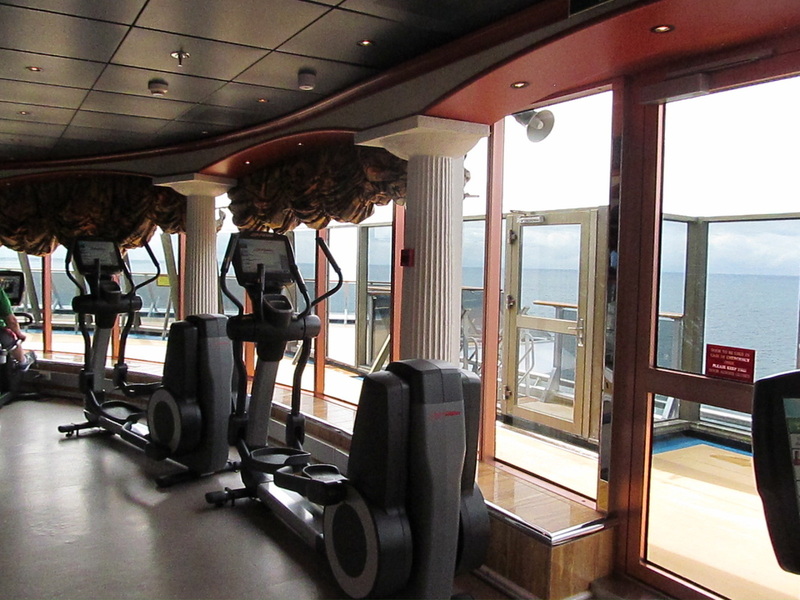 On the Lido Deck you will also find the Carnival Miracle's Spa and Gym facilities. 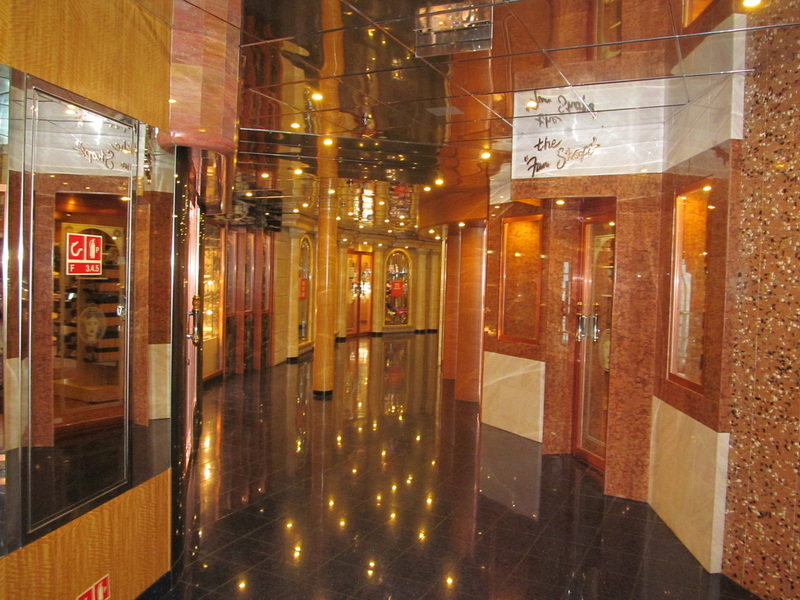 There is an entrance to the SPA by the forward elevator area. 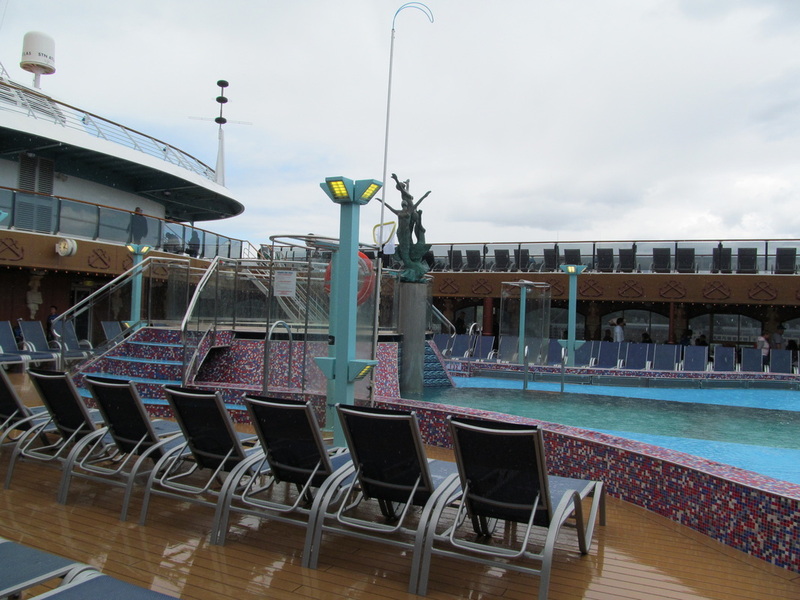 According to the deck plan the SPA and Gym are found on the Lido Deck and the deck above (Sun Deck). 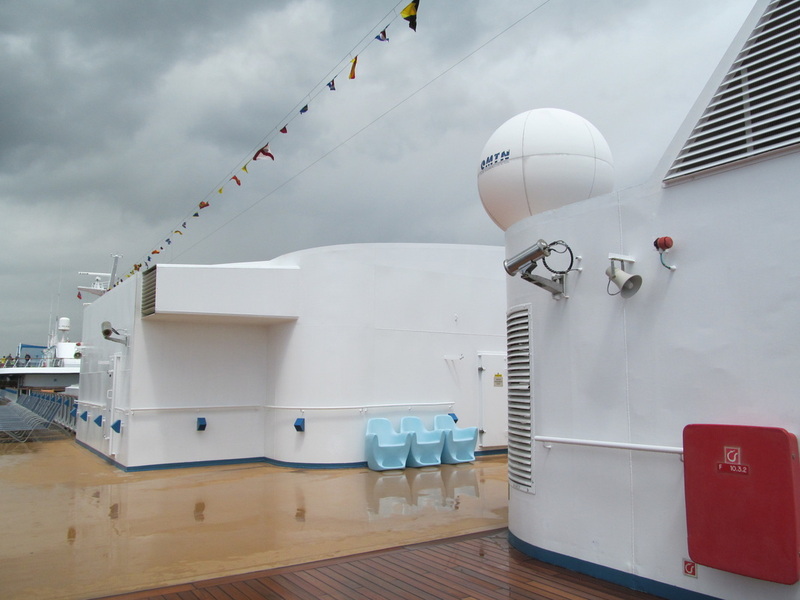 The Lido Deck is home to the Sirens FWD Pool. 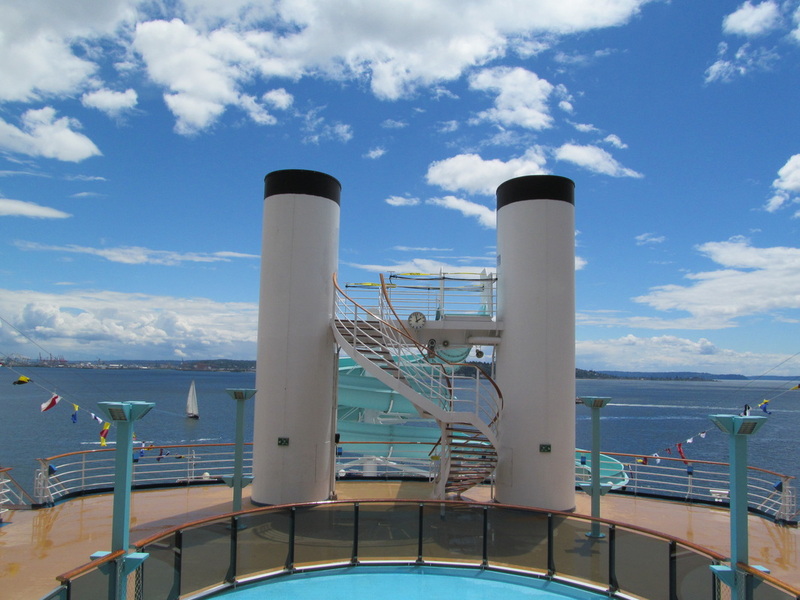 The Lido Deck has two distinct different pools that are separated by a divider. 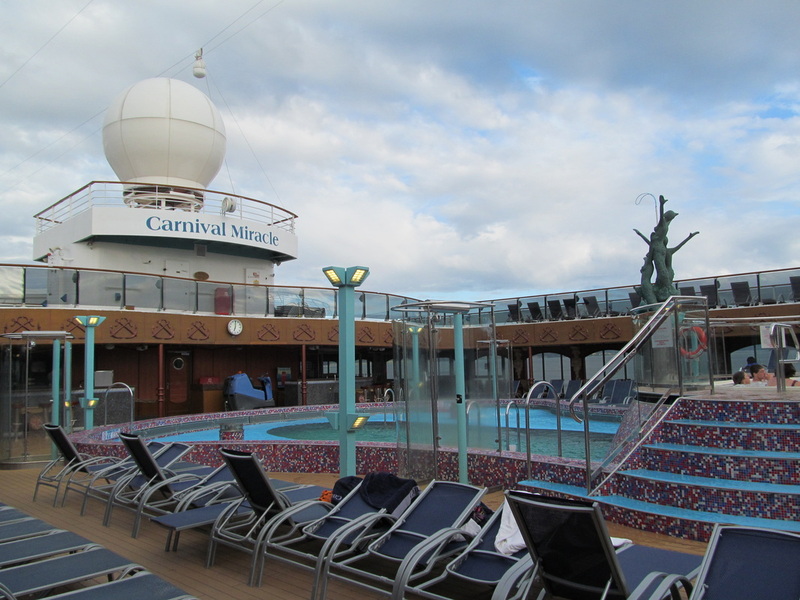 The Sirens FWD Pool is the pool that is pictured to the right. 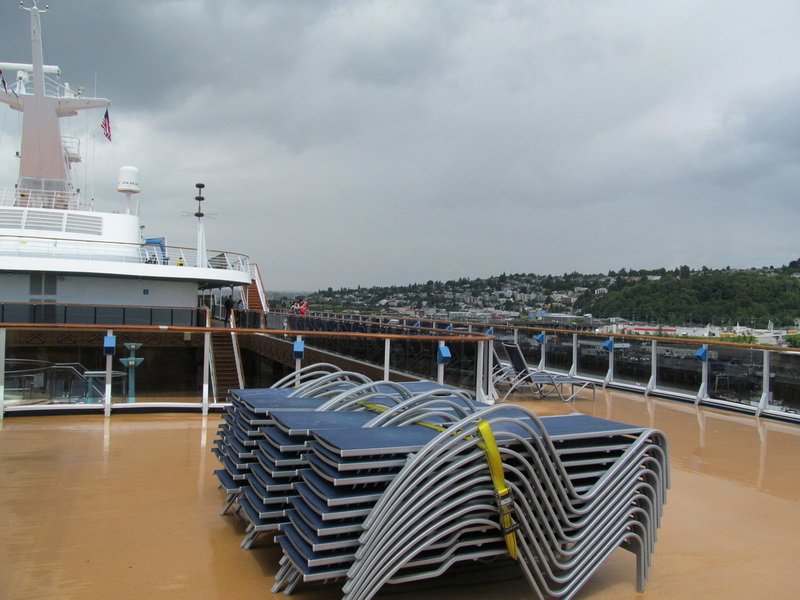 The other main Lido Deck pool is the Ulysses Main Pool. 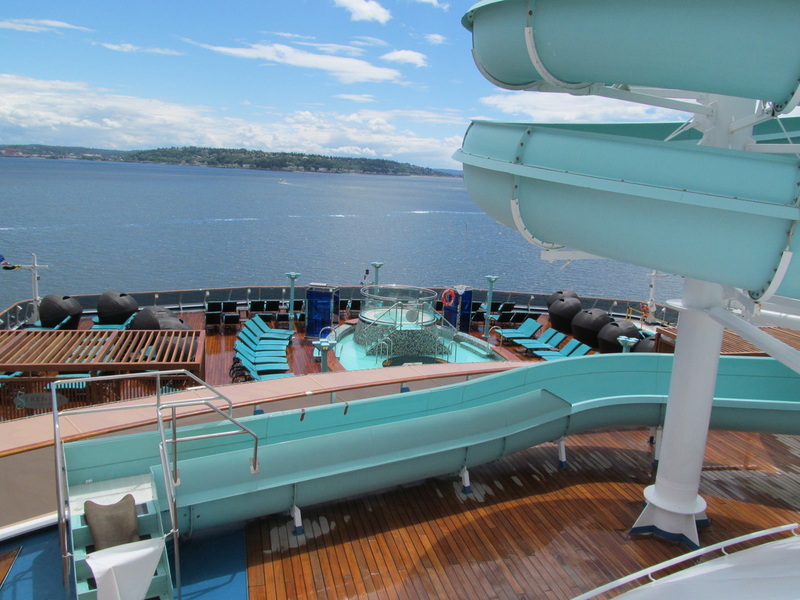 The Ulysses Main Pool is to the aft of the Sirens FWD Pool and behind the divider. 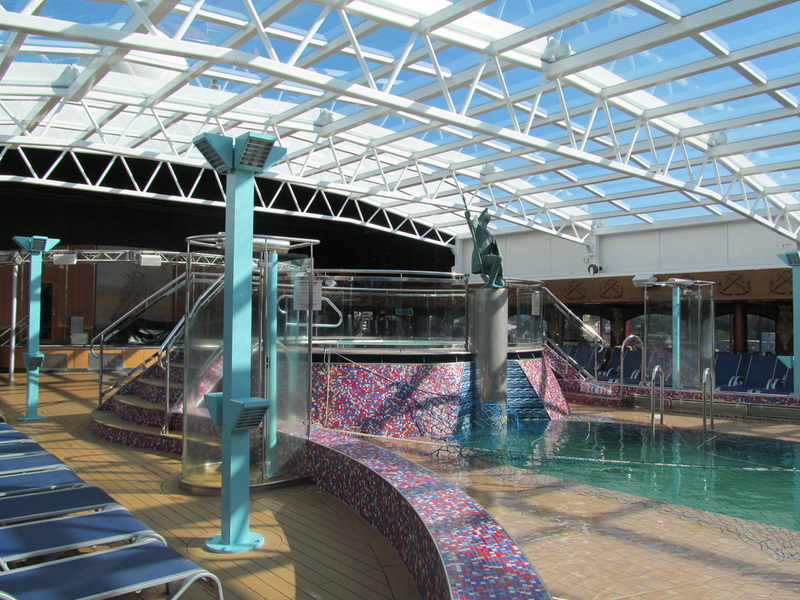 The Ulysses Pool has a retractable roof which may or may not be open. 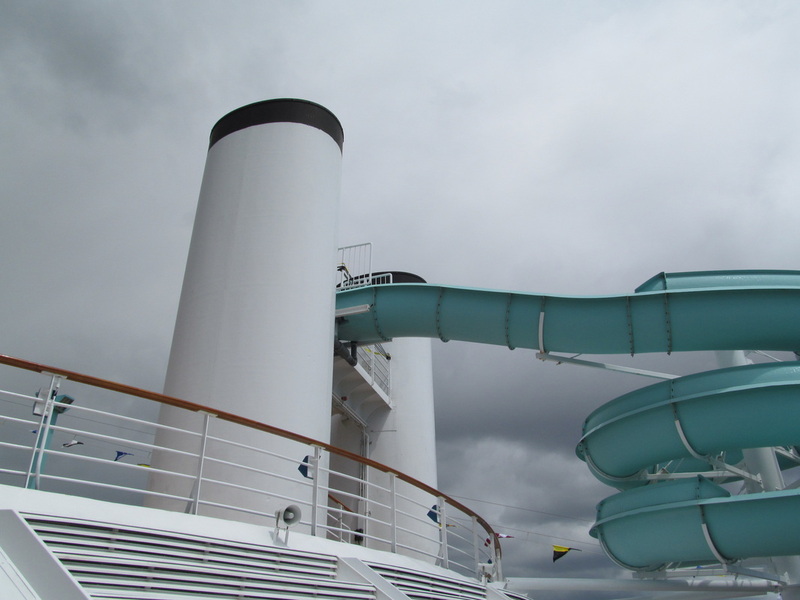 Be careful onboard not to get these two pools confused! 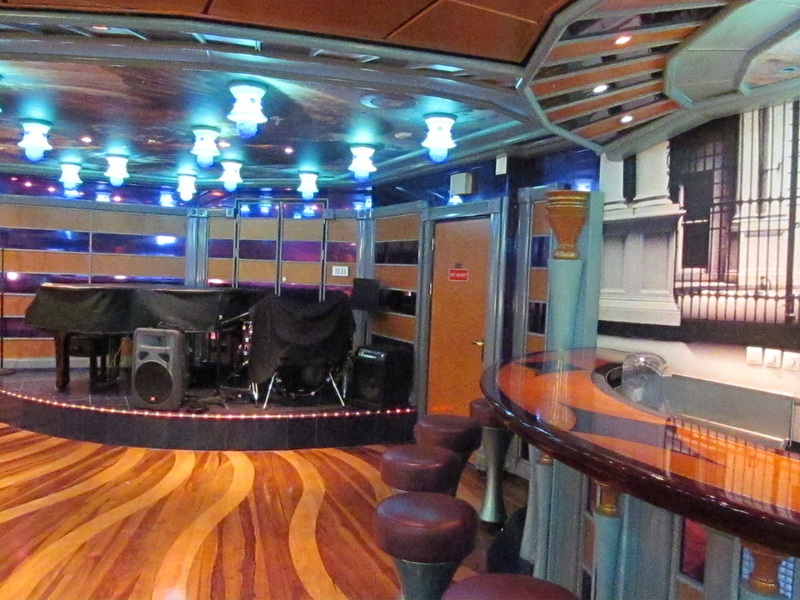 This section of the tour is dedicated to sharing pictures of the Sirens FWD Pool. 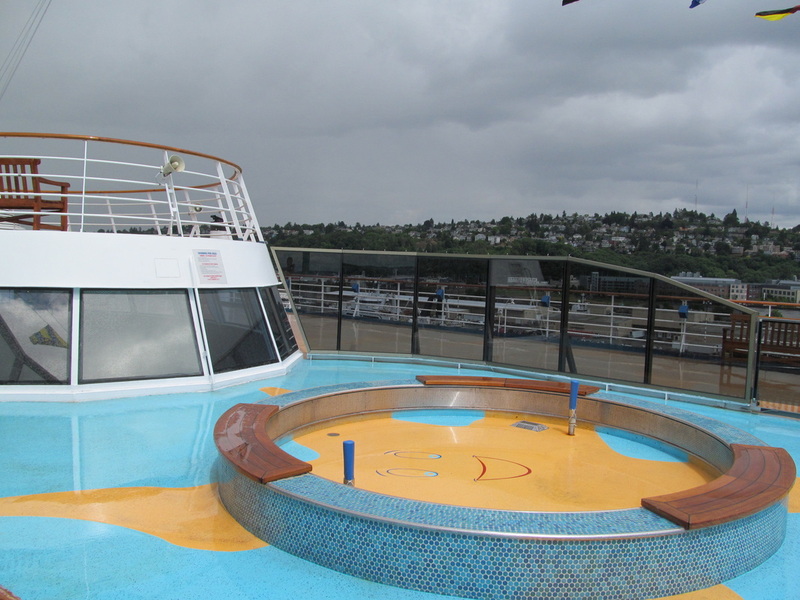 On the Lido Deck, behind the Sirens FWD Pool, you will find the Ulysses Main Pool. 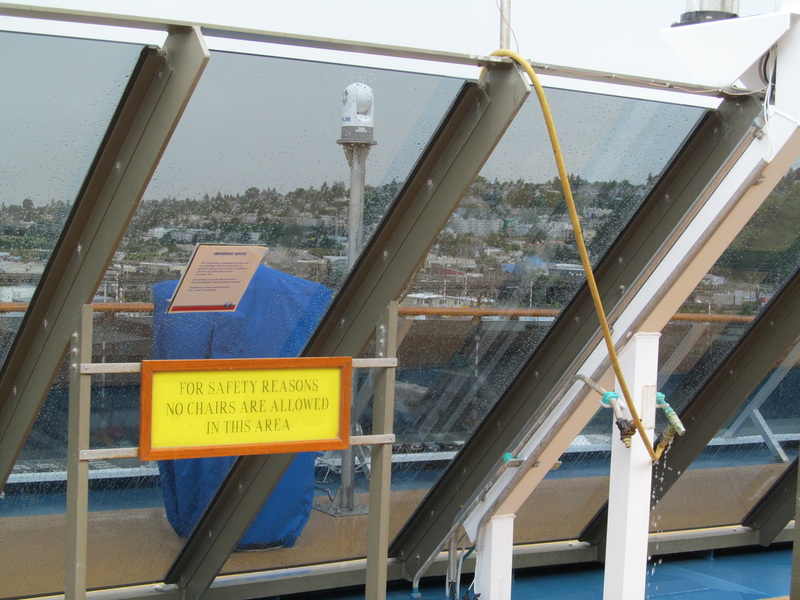 This pool has a retractable roof that can be opened and closed. 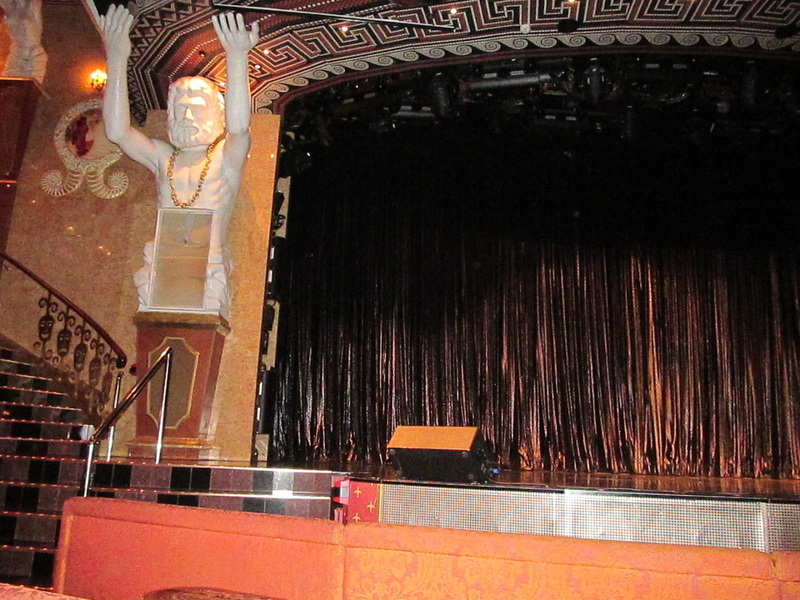 There is also a miniature stage by this pool that can be used for small scale events such as a DJ. 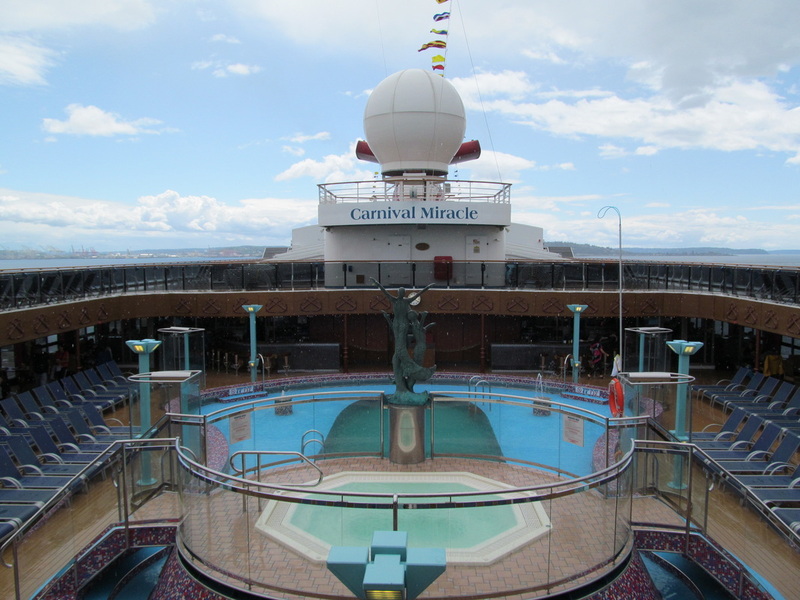 This pool is right by Horatio's Lido Buffet and the lines for both of the grills are by this pool. 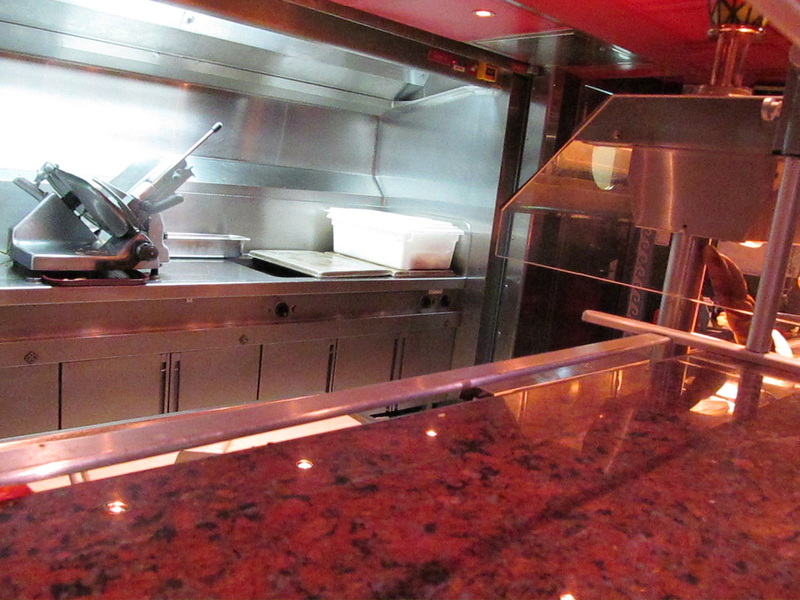 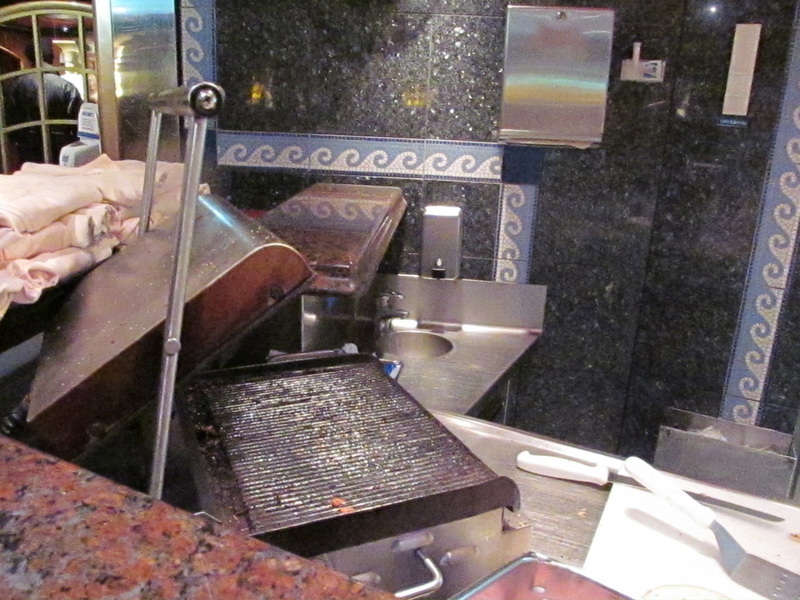 Horatio's is the name of the Carnival Miracle's lido buffet. 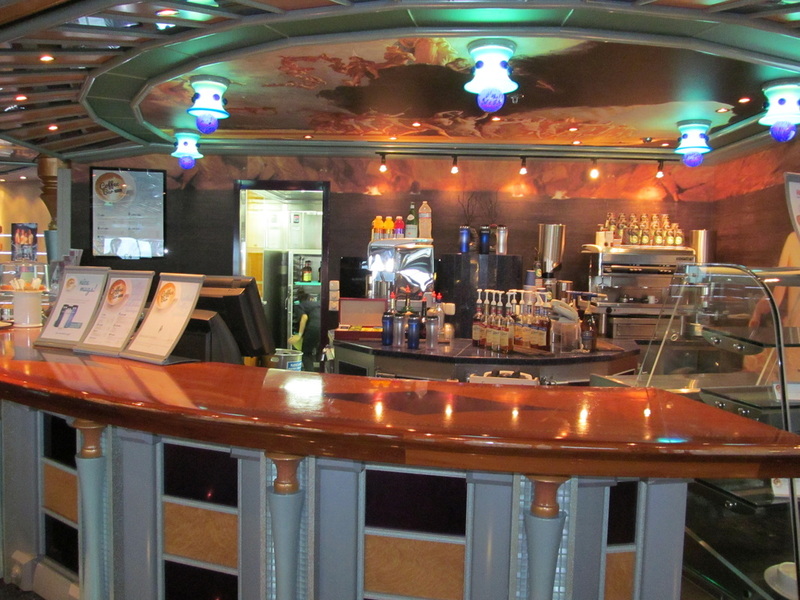 Horatio's has a variety of food serving stations which include things such as the deli, pizzeria, salad bar, grill, Chef's Choice buffet lines, a Chinese/Asian food line, ice cream station, and multiple beverage stations. 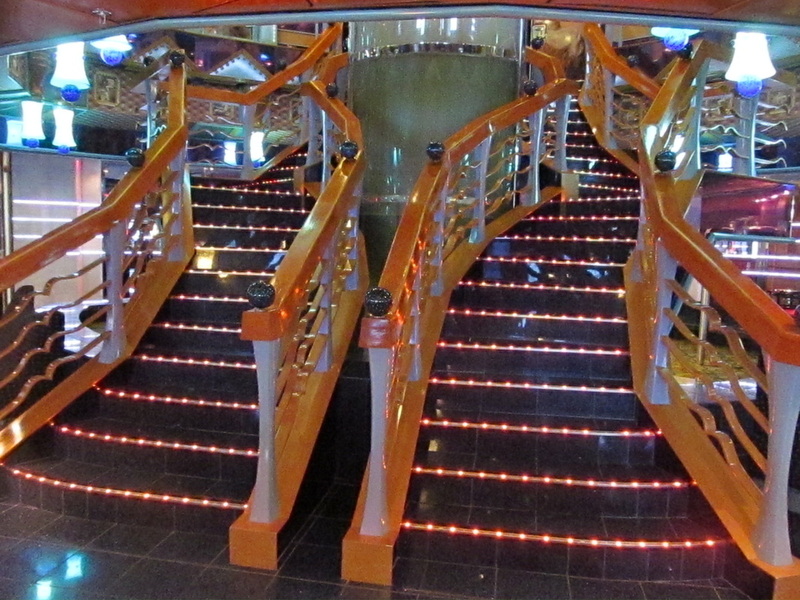 These pictures are in no particular order. 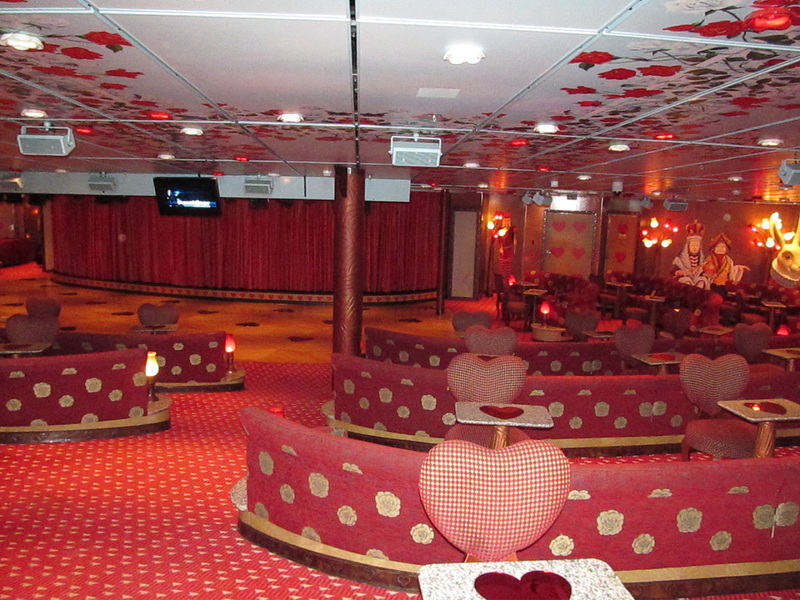 At the aft of the Lido Deck is the Serenity Adults Only Retreat. 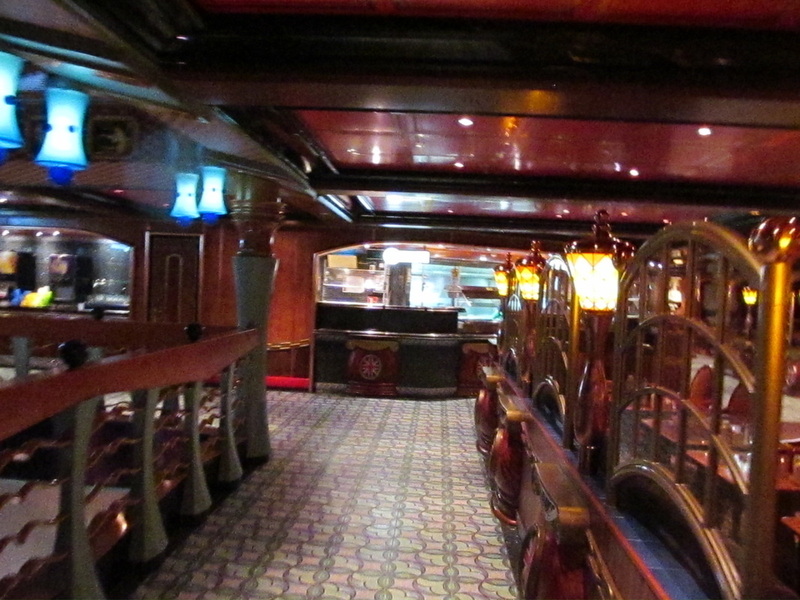 This area of the ship is for guests that are a certain age and older only. 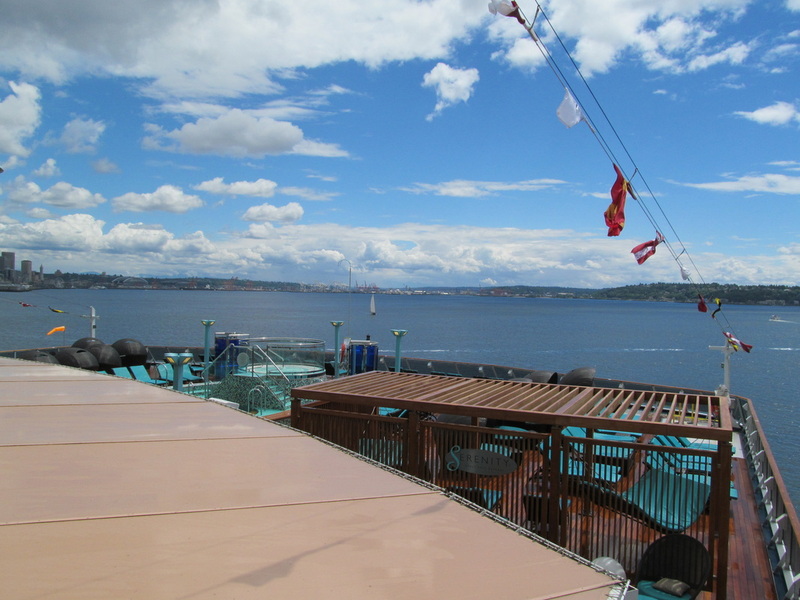 I did not spent any time back here, but I do have a few pictures of the Serenity that I will share. 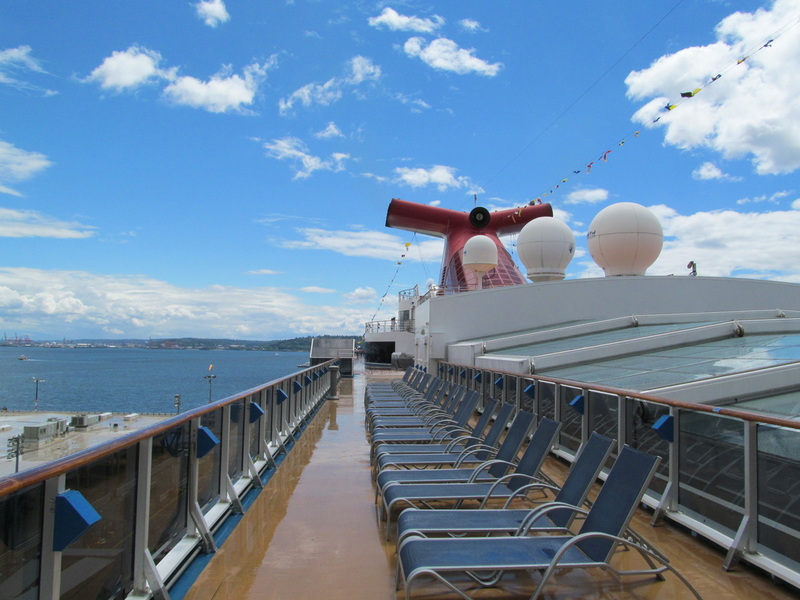 The Sun Deck (10) is located directly above the Lido Deck (9) and below the Sports Deck (11). 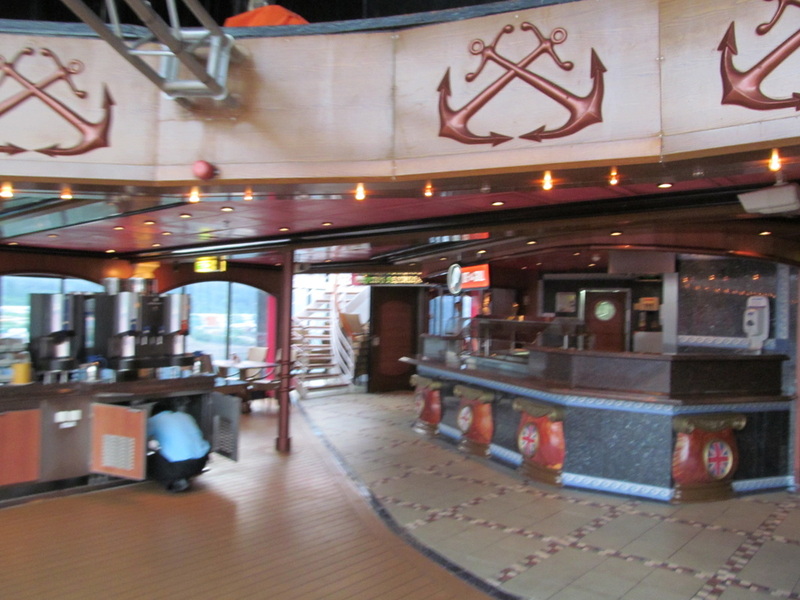 The Sun Deck contains the upper level of the SPA/GYM, Nick and Nora's Steakhouse, and the landing for the waterslide. 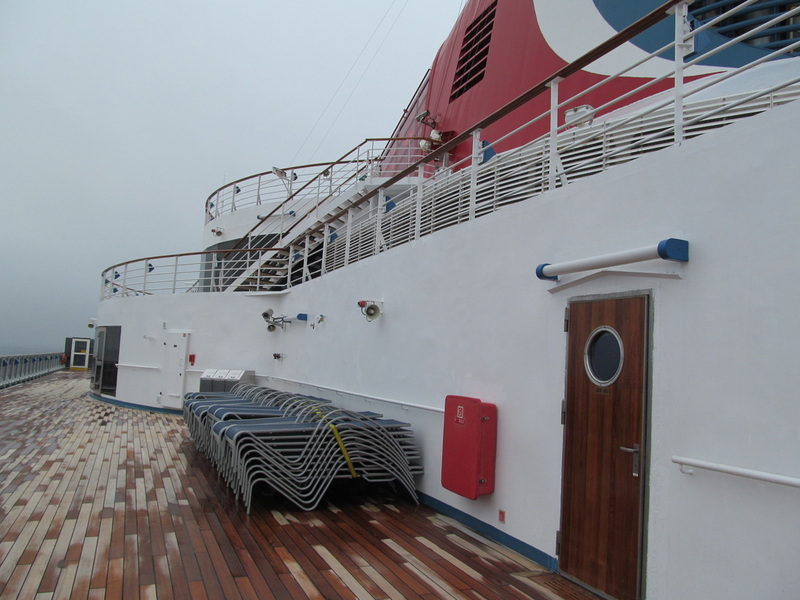 Deck 10 is mostly an outside deck. 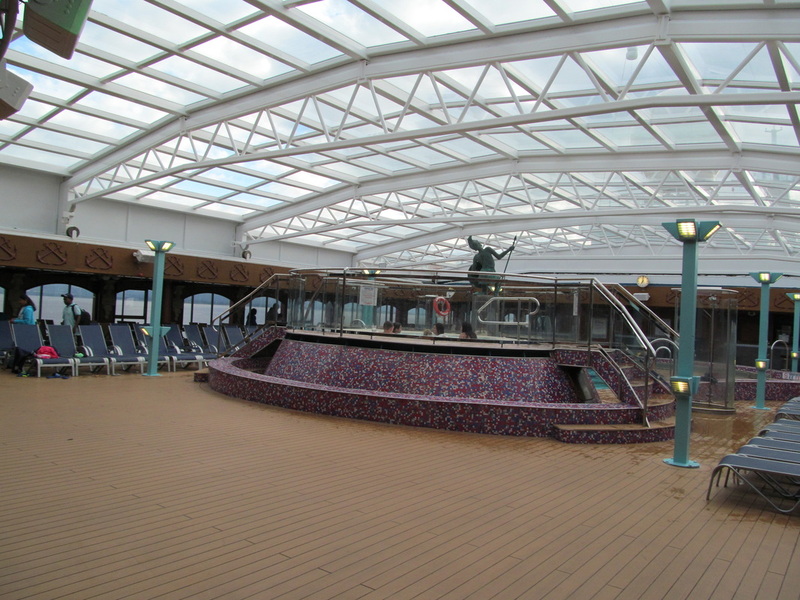 For this deck I will group the pictures by Nick and Nora's Steakhouse, the outside deck area, and the waterslide landing. 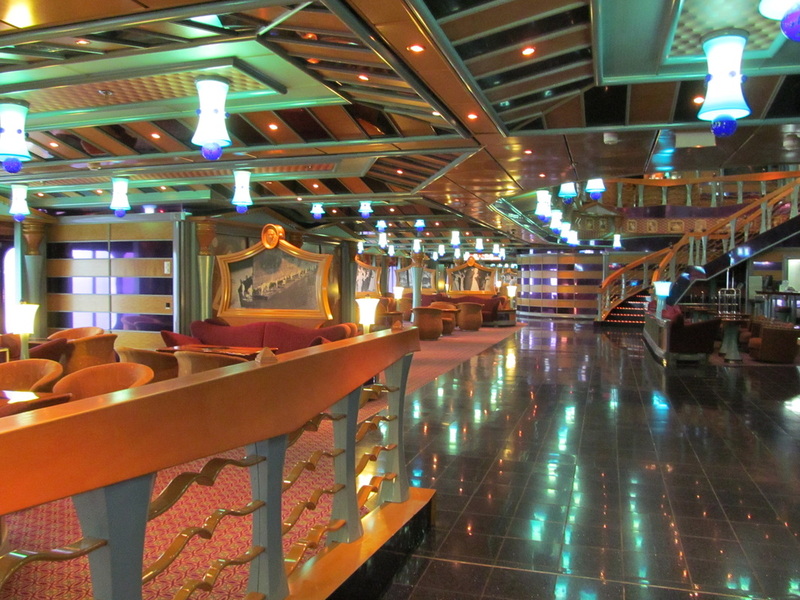 The pictures are in no particular order, except for grouping. 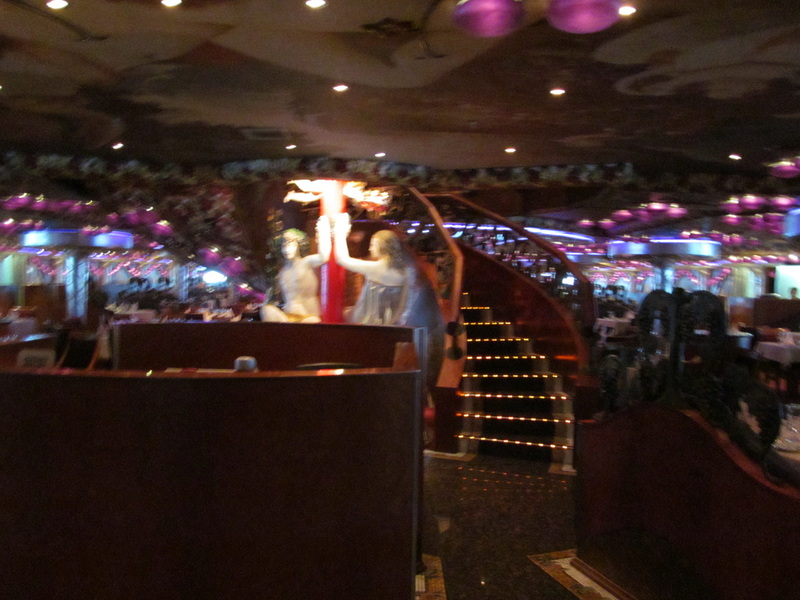 Nick and Nora's Steakhouse is the Carnival Miracle's steakhouse. 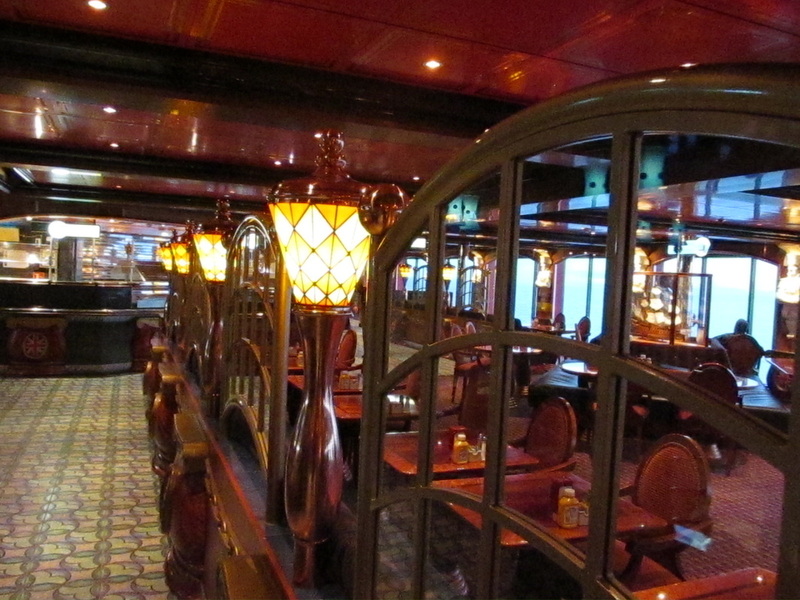 Nick and Nora's is located on Deck 10 and Deck 11 above Horatio's. 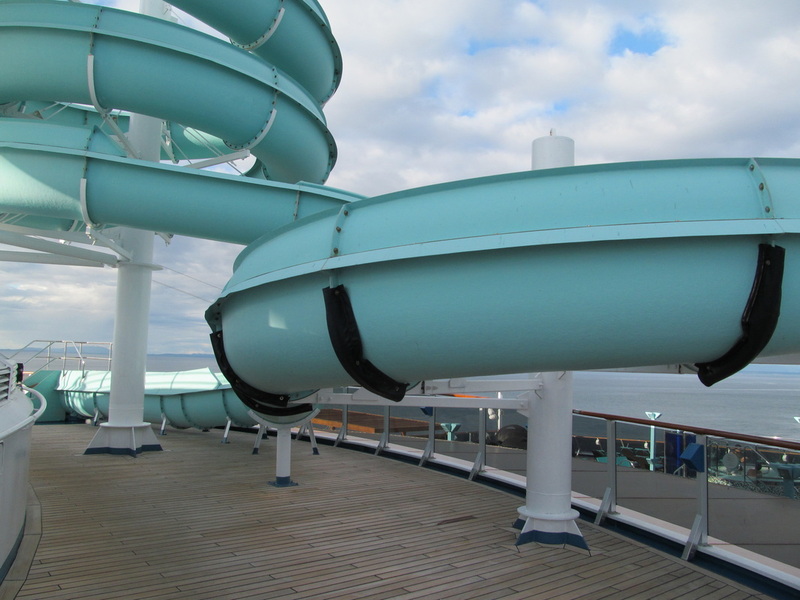 The waterslide landing is located on Deck 10. 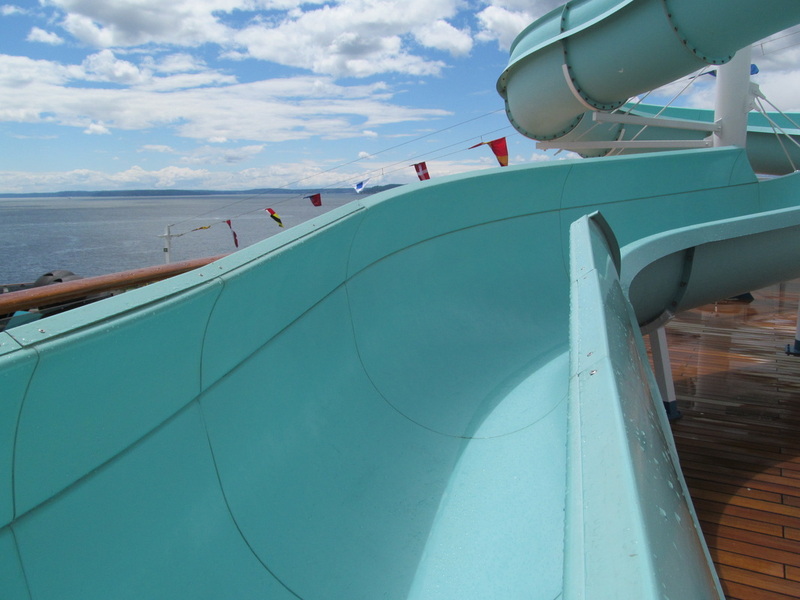 Here are some pictures of the waterslide from Deck 10. 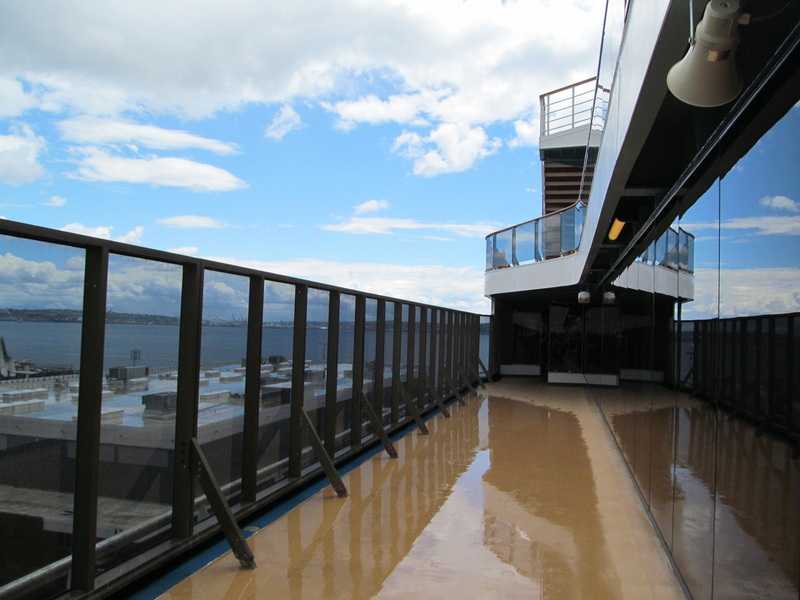 The Sports Deck (11) is located directly above the Sun Deck (10) and below the Sky Deck (12). 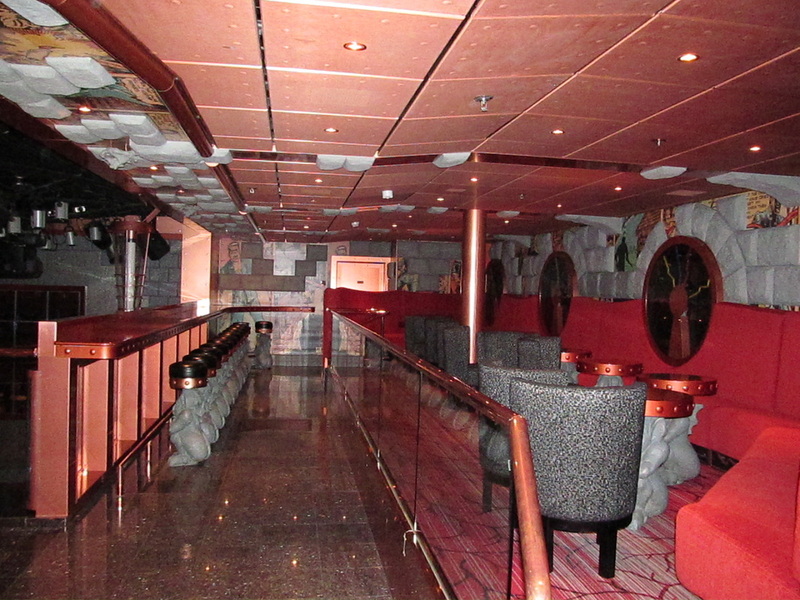 The Sports Deck contains the jogging track, mini golf course, the second level of Nick and Nora's steakhouse, and the entrance to the waterslides. 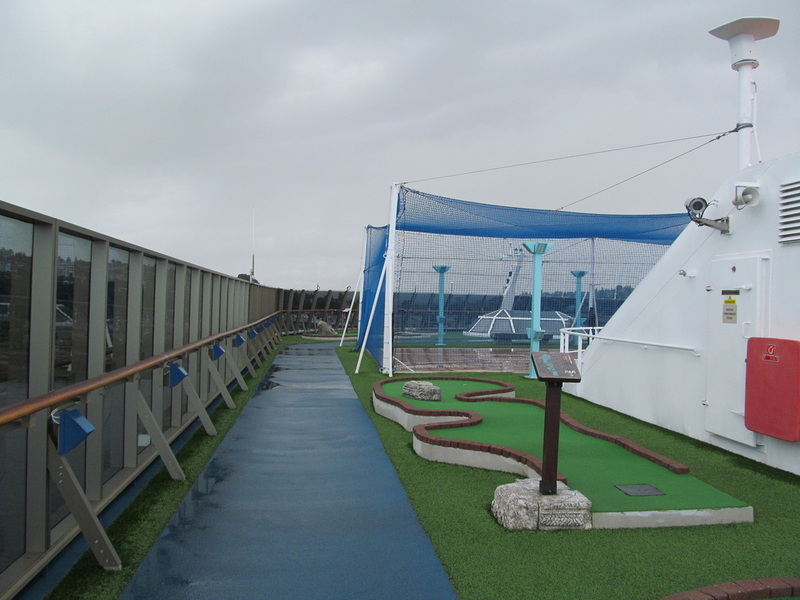 Here are some pictures of the mini golf course and the jogging track. 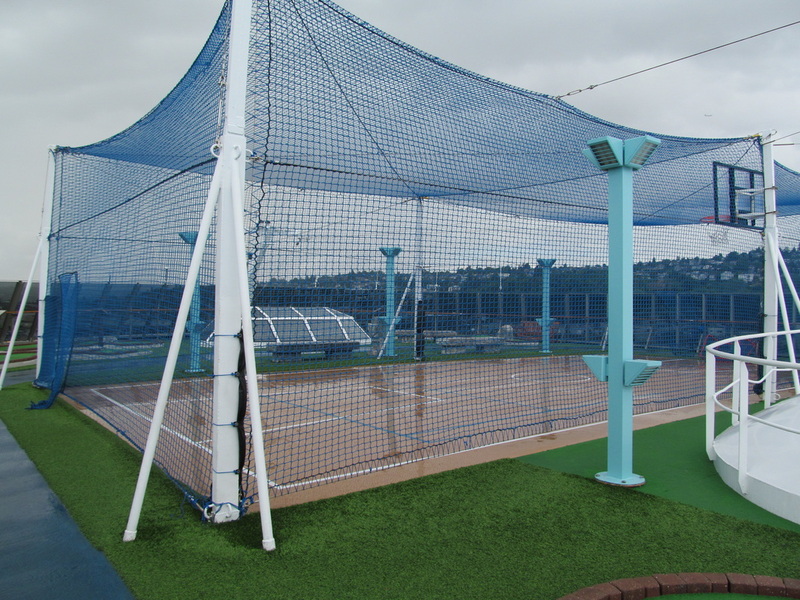 Both of these are located on the FWD part of the Sports Deck. 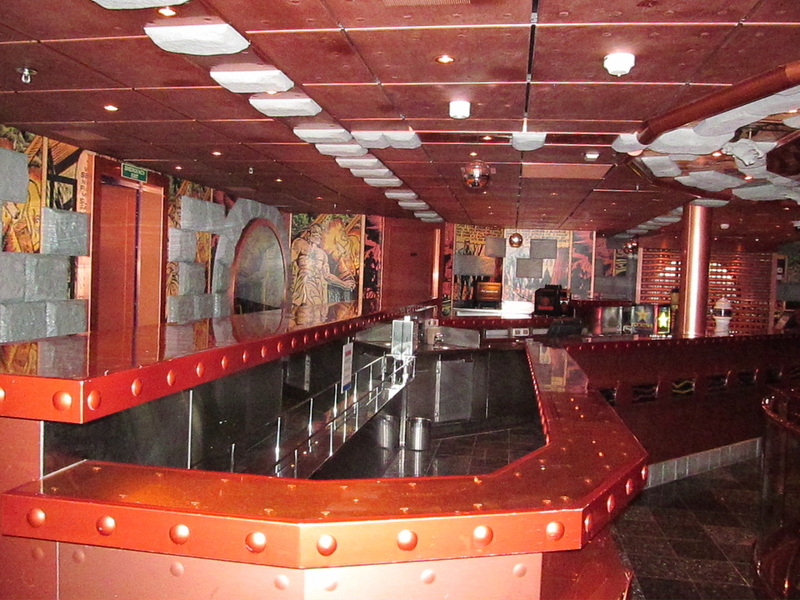 Please keep in mind that the ship's appearance or décor may change over time and during dry-dock. 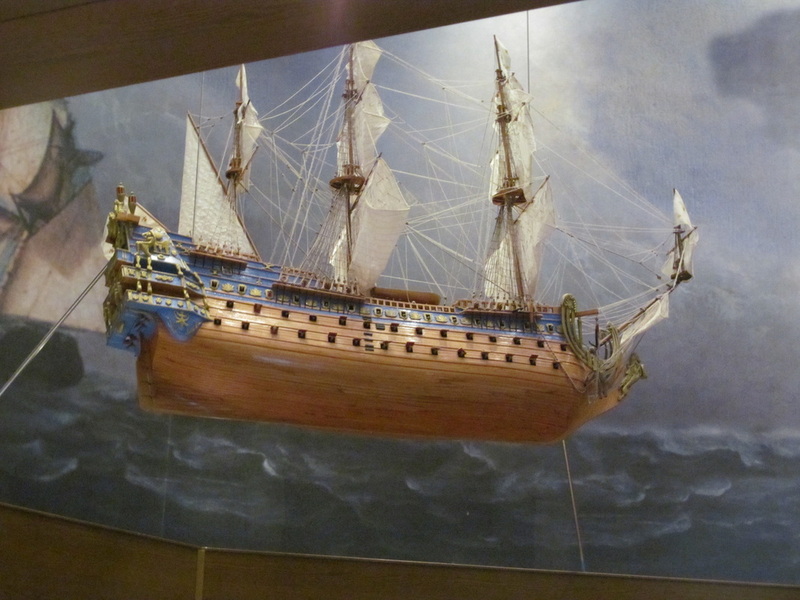 Photos may not represent the up to date version of the ship after changes.